Battle mages are pretty much a fusion between warrior and mage. They use magic to create weapons, armor, and to do other things that'll help them in melee combat. 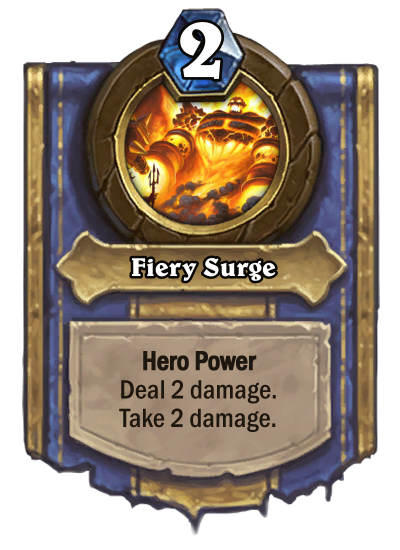 The hero power may seem weak, but it trades really well, being able to take out minions like Dire Wolf Alpha , Sorcerer's Apprentice , and so on. The downside is also redundant if you use it after attacking, as you wouldn't have been able to attack anyway. Strengths: Versatile (Has a large Variety of tools at their disposal). 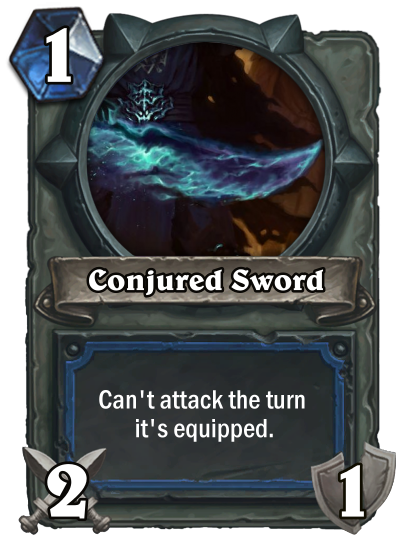 Weaknesses: Obvious (Conjuring a weapon takes time, and spellfury needs a decent weapon so you need to think ahead, and your opponent has a chance to interrupt your plans), brutally countered by weapon removal. 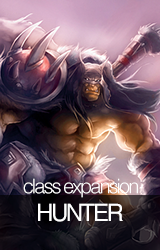 More will be revealed as the class is fleshed out! 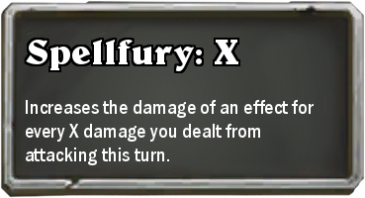 Spellfury gives 1 damage for every X damage your hero did from attacking this turn. So if your hero did 10 damage, Spellfury: (1) would give 10 bonus damage where as Spellfury: (3) would only give 3 (it'd give 4 bonus damage if your hero did 12 damage). It can be tricky to master as damaging minions to buff your Spellfury can lead to you not needing the bonus damage. Also don't worry, there will be ways to go all out with this! 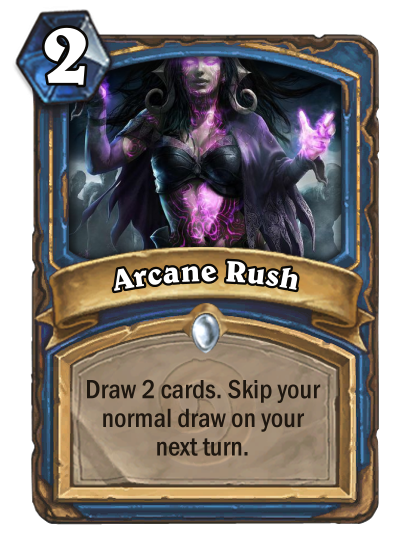 Arcane Rush: Don't think of this as a 2 mana draw 2 with a drawback, but as a 2 mana draw 1 with an upside (you can play your next draw immediately). 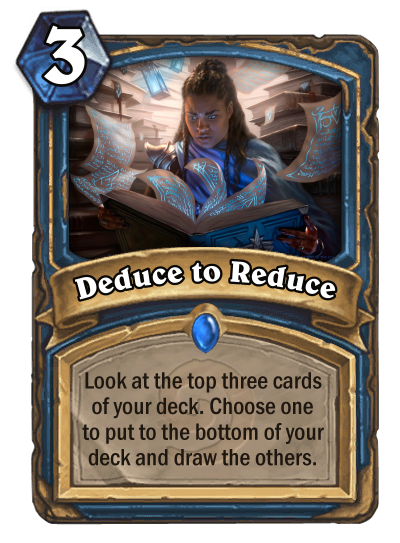 You'll only skip 1 draw even if you play more than one on a turn! 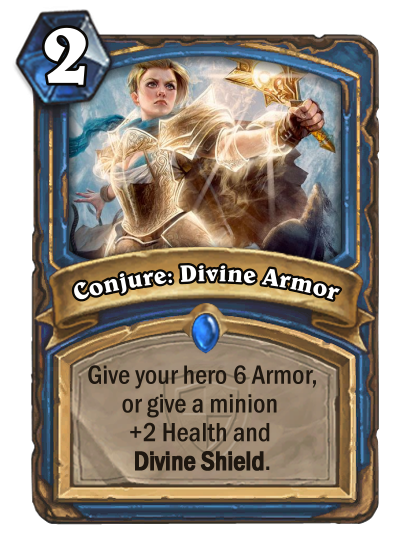 Conjure: Divine Armor is an example of one of the classes themes, targeted cards with effects that change depending on the target. It has a paladin theme due to being from TgT. 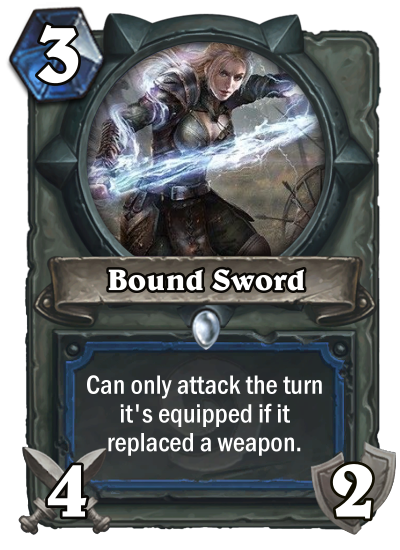 Bound Sword: Has the typical can't attack when equipped battlemage theme, but with the option of trading some value to gain tempo. 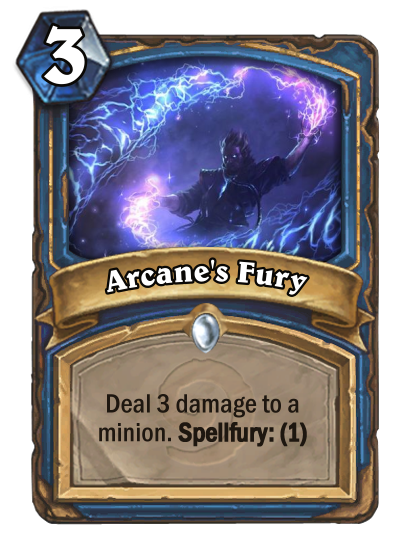 Arcane Fury: If used alone it's pretty weak, but spellfury (1) makes it gain damage easily. 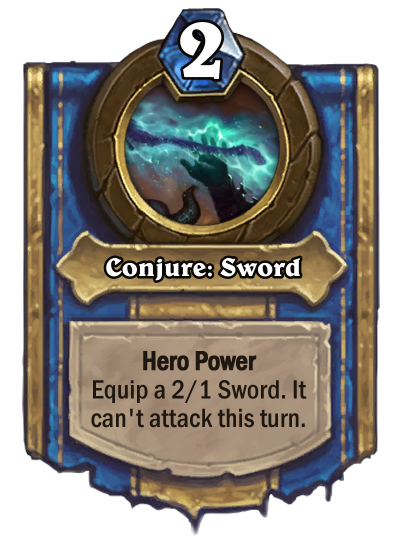 This can deal 5 damage just with an attack from the hero power weapon making it pretty good! 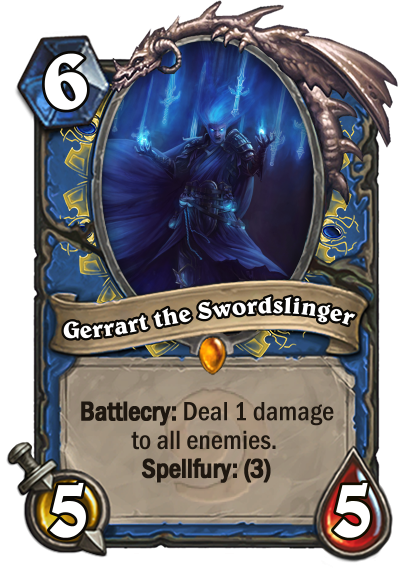 Gerrart the Swordslinger: On his own he's an alright card. 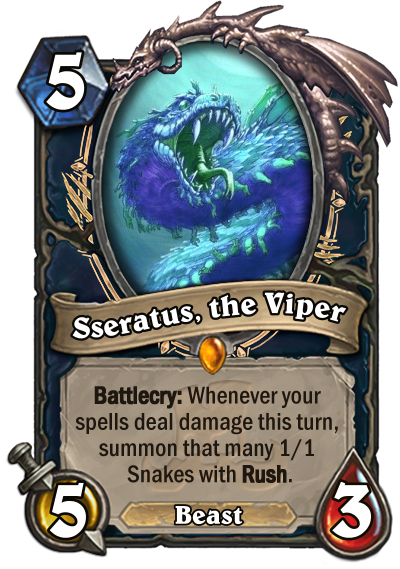 Normal decks will have some difficulty getting more than 1 bonus damage out of spellfury (3) , but decks aiming for big spellfury turns will love this guy. A simple, classic legendary that shows what the class is about. Researcher is a class that is all about knowledge, science, and everything related to those. The class can draw cards well, but to balance that out, many of its cards are combo-dependent, situational, or have drawbacks in other ways. 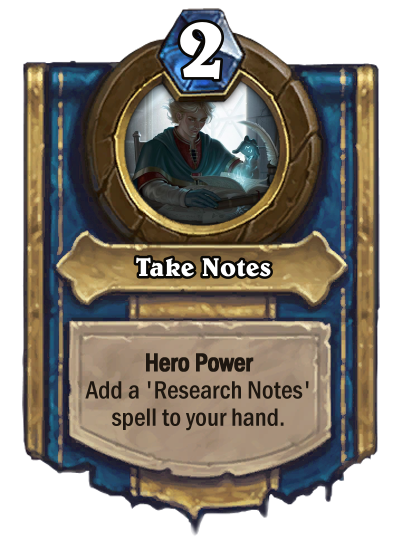 Researcher is unlikely to have cards that can answer to a situation whenever and with no trouble. Spells are another important thing for the class, and many of its minions synergize with them. 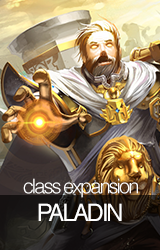 The class also has its own keyword, Study, which gives you a benefit if the last card you played fills a specific condition. Here I have Replicable Results, a spell which uses Study, as an example of the keywords formatting and of what could be done with it. In card text, it is written like "Study a (condition): X", and while uncommon, some cards, such as this one, might refer to the card that has been Studied. 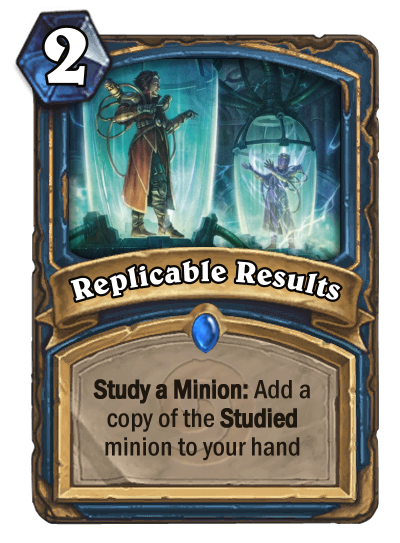 Replicable Results itself could be used to gain value by copying some big minions, or to duplicate minions for combos. Deduce to Reduce: Researcher gets good card draw tools, and Deduce to Reduce is one of them. Same cost and same amount of draw as Arcane Intellect, but this lets you have some control over what you specifically draw, and gets through your deck faster. 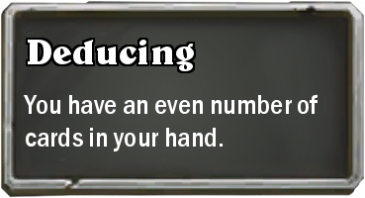 In a combo or control deck, you could use this to get those combo pieces or answers you need at the moment. 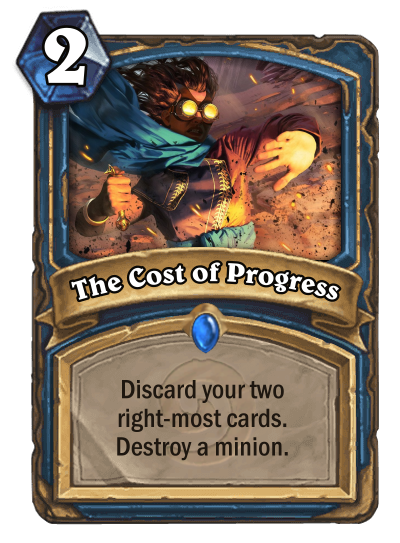 The Cost of Progress: For just two mana, this destroys a minion, but with the hefty cost of discarding two of your cards. If you can overcome that cost, it's quite strong. 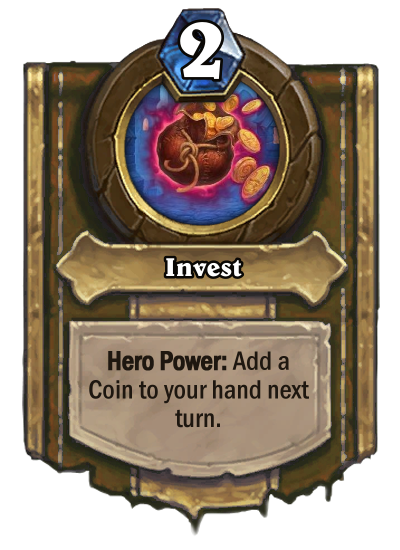 You could draw more cards to replace those you've lost, use the hero power to avoid having to discard valuable cards (the token goes to the right side of your hand), or you could play a tempo-like deck where the efficient way to gain board advantage is more valuable than the card advantage you lose. 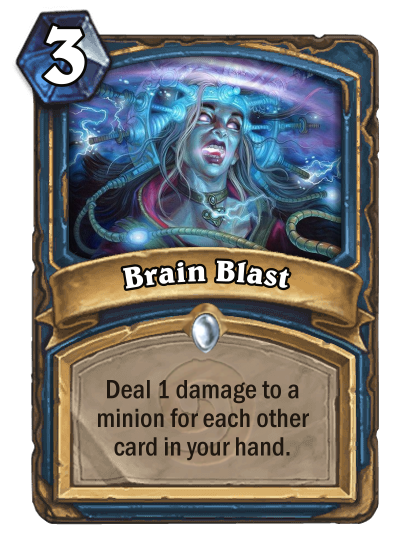 Brain Blast: A removal spell that is made more powerful by the card draw in the class. Especially strong in decks that tend to keep their hands large, like control and combo. 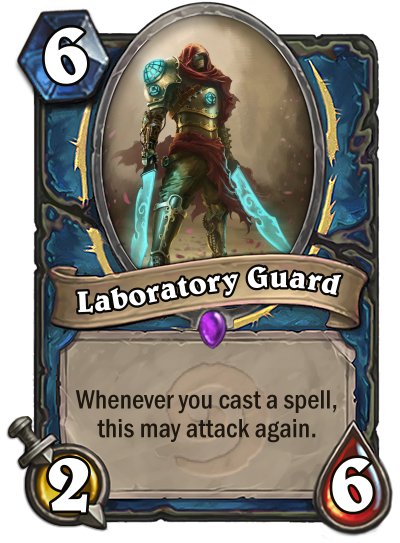 Laboratory Guard: One of many spell synergy minions in the class. Could be used as a finisher in a miracle-like deck, if you can keep it alive for a turn. 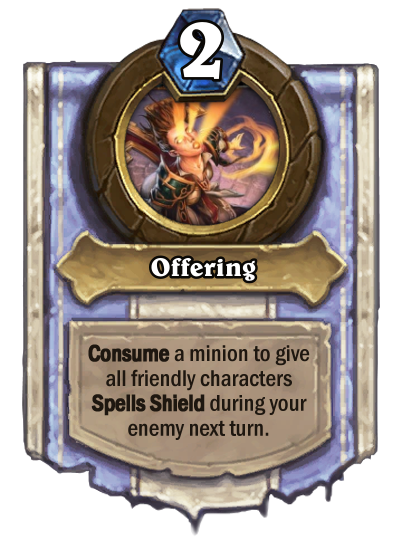 Buff this up with an Abusive Sergeant or something similar, then spam as many spells as you can for a large amount of burst. The Bladeslinger class is a Jack-of-all-Trades type, so he can pull out one of his knives in any situation. Bladeslinger cards have a great variety of uses, covering all the possible bases, but this variety comes at the cost of card efficiency. I've got a nice assortment of rarities for the showcase cards today! 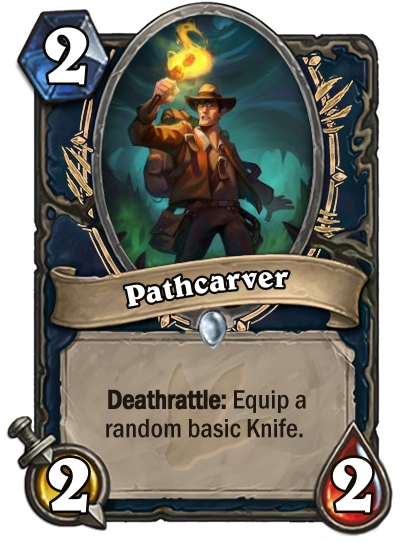 Pathcarver: A simple common from Journey to Un'goro . 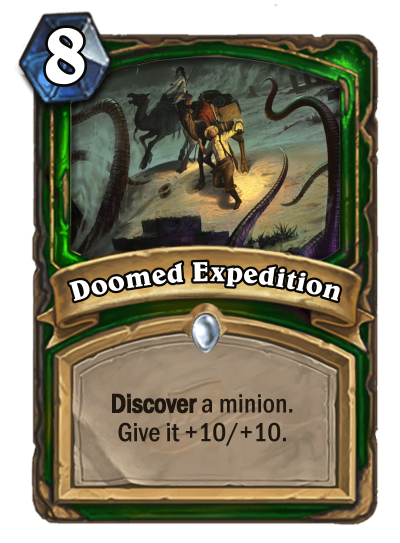 This explorer will drop his tool for you upon his untimely demise. 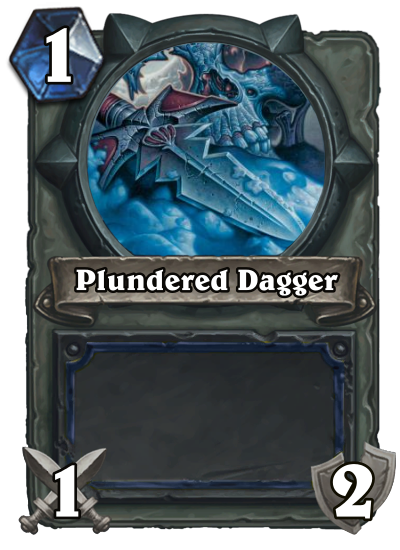 While this might be a bit above the curve, it makes more use of Bladeslinger's themes of using whatever they have at their disposal... even if it belonged to a dear friend. May he rest in peace. Spirit of the Viper: The spirit for Bladeslinger's Rastakhan's Rumble set. 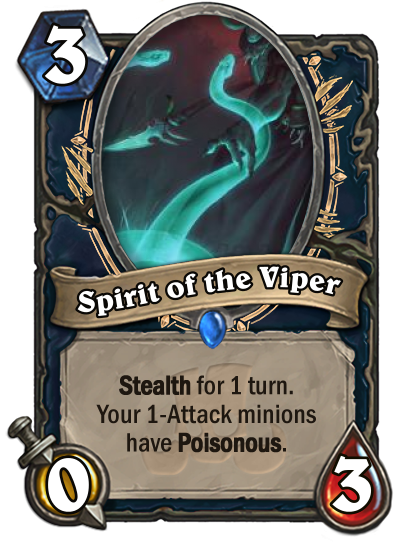 I'm sure you can already see the synergy with the Viper Loa. 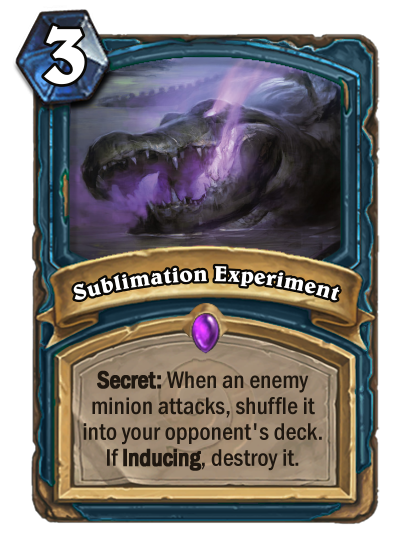 It doesn't stop there however, as I have ideas for making Poisonous a theme for Un'goro as well, so you'll be sure to see more as time goes on. 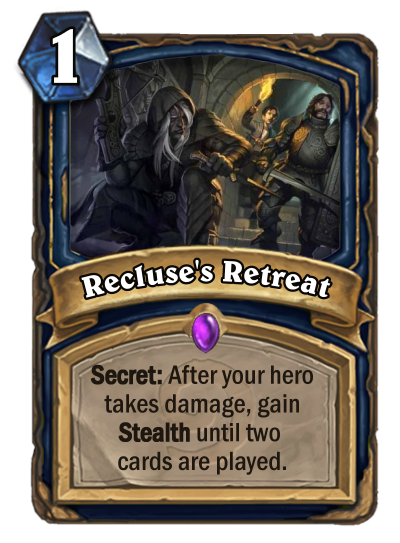 Recluse's Retreat: Easily the wackiest of the showcase cards today, as Epic-rarity cards frequently are. 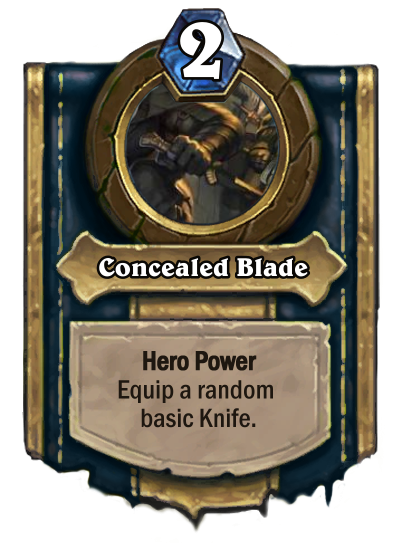 And, yes, Bladeslinger will use Secrets , as Rogue always should have. This Secret acts as a flavorful form of protection for a weak Bladeslinger, as they go into hiding. But be careful; if your opponent advances, or you make too much noise, you'll be found out! Sseratus, the Viper: Behold, the Bladeslinger's Loa of Vipers and Snakes! This vicious reptile will call upon its underlings to feed upon those made weak by your spells. The vipers of course become even more dangerous with Poisonous from the Spirit. I have some plans laid out for each and every set we are going to make cards for, so make sure to vote to see what is to come! A godborn is an offspring of a divinity whose only purpose is to gather followers to worship its creator. The class revolves around earning the favor of a god by gathering worshipers and doing other worthy deeds. In exchange for your obedience, your god will reward you accordingly and will aid you in defeating your opponent. Hyperion is the son of Ra, the god of the sun. His duty? Praising the sun and cleansing the world through flames. Exiled from the realm of the ancient gods into the world of Azeroth, Hyperion has begun a quest to reclaim his place in the sky by earning the favor of different gods, including his father. Will his odyssey be victorious or will he fall on the battlefield? 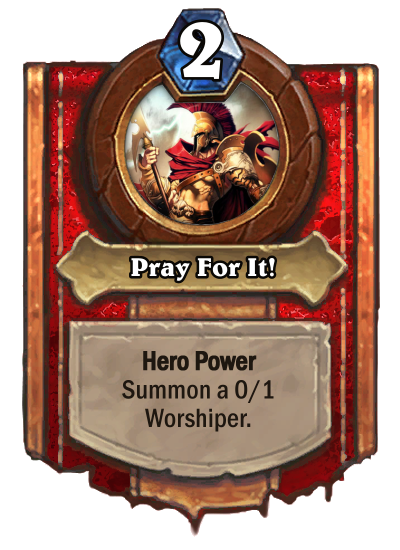 The godborn's hero power is: Pray For It! , allowing our hero to gather Worshipers who can earn the Favor of the gods. Favor is a new keyword which allows our hero to gain access to great powers. The godborn revolves around earning and spending Favor to obliterate his enemies. 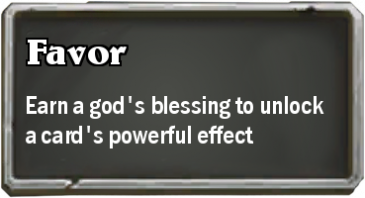 Favor acts like a Choose one effect, allowing you to either choose the basic effect of the card or the Favor one, if you need a more powerful option to deal with a situation, considering you have earned enough Favor throughout the course of the game. Spending Favor permanently removes that amount from the Favor tray, so spend it wisely. Both the basic and the classic set will revolve around a fire/sun theme, given that our hero is the offspring of the sun god Ra. I will try my best to make every card feel important for the identity of the class and make them as interesting as possible. 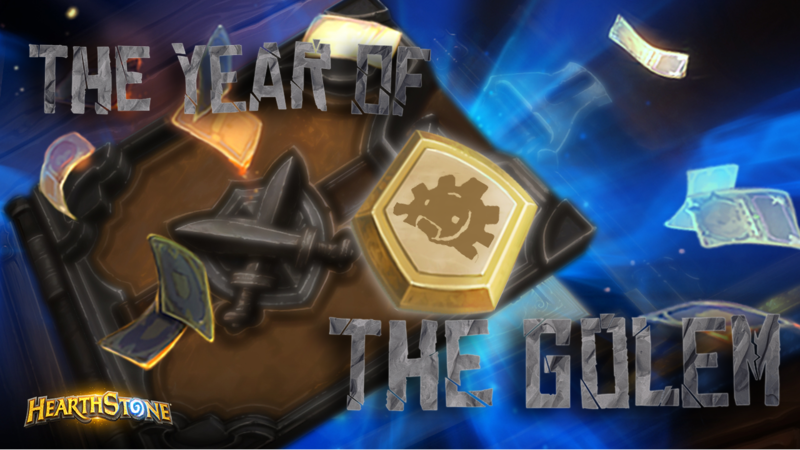 Future sets will explore gods from different pantheons according to the expansion's thematic. Here are the 5 example cards that present how the Favor mechanic works. 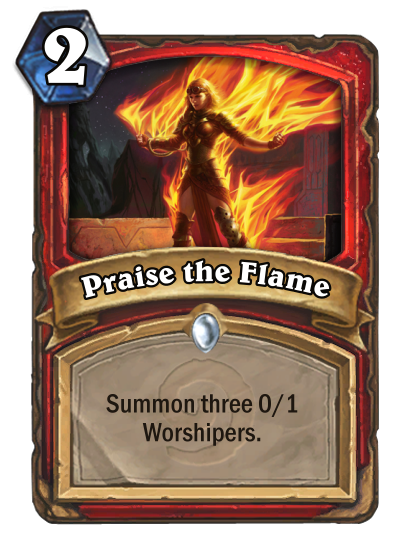 Praise the Flame is, besides your hero power, the main source of gathering Worshipers and earning Favor . 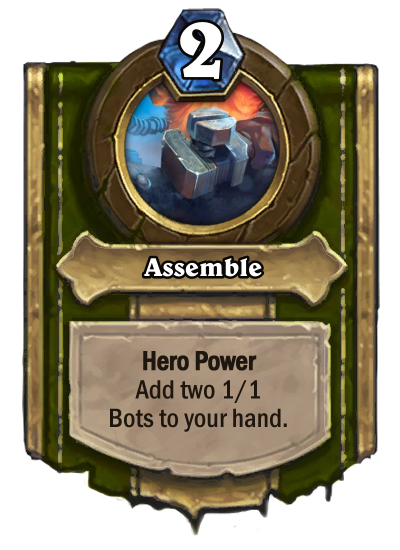 The token is the same as the one produced by the hero power. 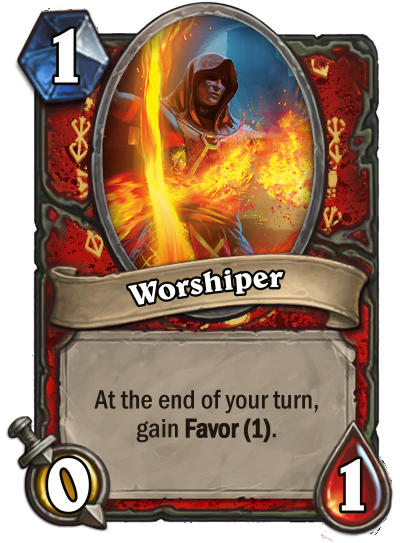 This card is good for ramping the Favor but the tokens can also be buffed to create a board of powerful acolytes. 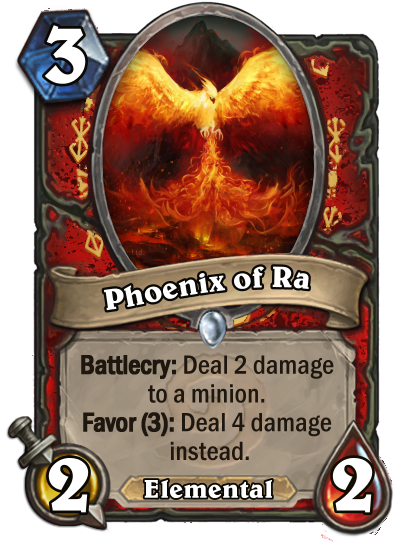 Phoenix of Ra is one of the god's most loyal servants and it can be used as a low cost removal, if you are willing to spend Favor to unlock its power. 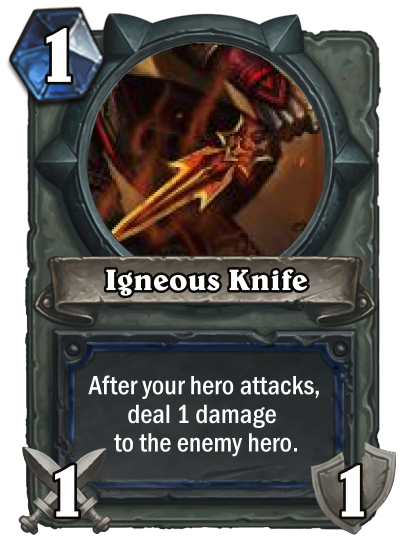 Even without the special ability, it represents a good stated minion that can burn an enemy minion to a crisp. 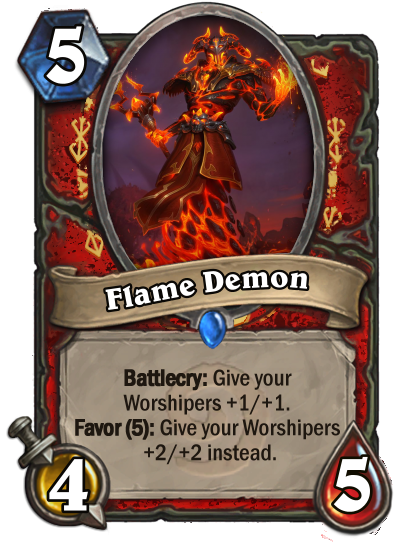 Flame Demon is a card that directly interacts with your Worshipers , trading Favor for raw power. If you decide to bargain with the demon, you army will grow, but your soul may be lost forever. 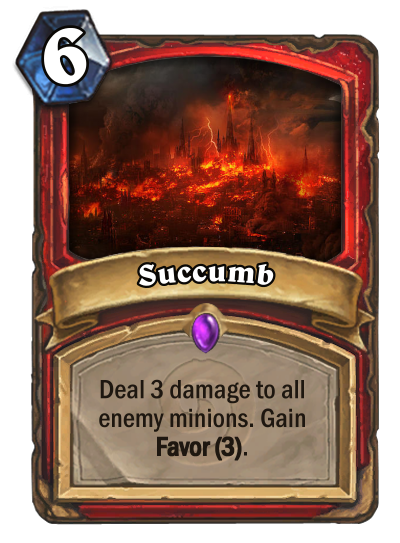 Succumb is a mass removal that allows you to gain your god's Favor by raining pure fire over those who dare oppose you. If any enemy is left alive, a Phoenix of Ra will be a great follow-up. 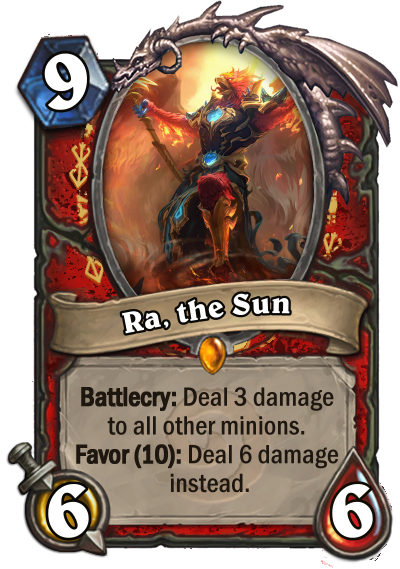 The last card is none other than Ra, the Sun , the first god introduced by the Godborn class. As a high cost board clear, Ra is the only one who stands when the fight is over. 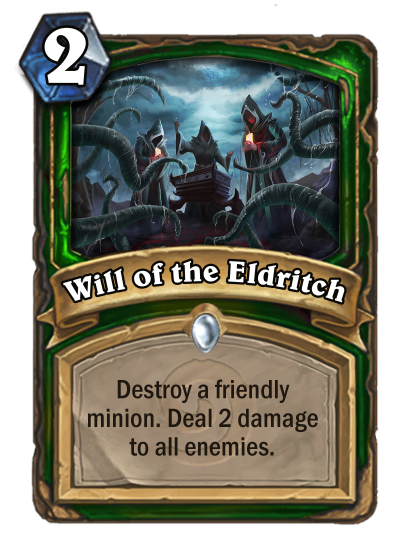 The most powerful Favor effect so far, Ra will obliterate every single living minion on the board and will reign supreme over the battlefield. Our hero's father will also be his savior, if you have worshipped him for long enough. 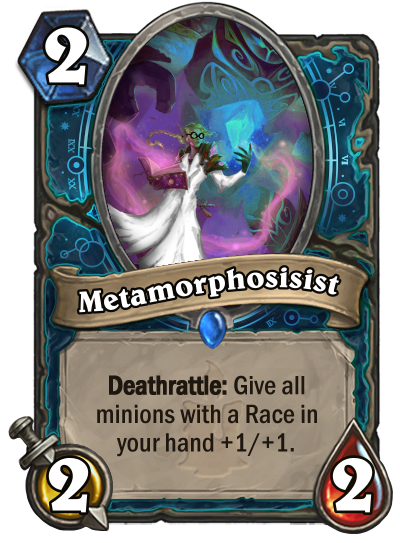 All the cards are from the classic set because this will be the core identity of the class, with future sets exploring different archetypes and new ways to gain and spend Favor. I am happy to present you with the Godborn class and i hope you like it as much as I do. Future sets will follow our hero's footsteps into different places, ruled by different gods. For example, Un'goro will be a journey on the domain of Artemis, the greek goddess of the hunt. She will send us on a dinosaur hunt you will never forget. A crusader of darkness that wields deadly shadow magic and an arsenal of grim weapons; one that summons armies of darkness to do its bidding; that which will sacrifice its own companions to achieve its own goals - Meet the Necrolyte! The whole flavour behind the class is that of Darkness and shadows, Shadow Magic, and dark pacts of Sacrifice. Basically the opposite of a Paladin. The playstyle would range from Aggro, to midrange, to a more control/stall/hand-oriented playstyle. Strengths: Good single-target removal; Good board control; Both aggresive and control-ish; Powerful card generation. Weaknesses: Drawing is a bit more limited; Lackluster AoE; Most powerful cards are at the expense of minions; Lackluster sustain. If there is one thing a Necrolyte is feared for it's the horde of twisted fiends it can command. Using its Shadow Magic, this dark crusader can summon Shadows to assist it in battle. 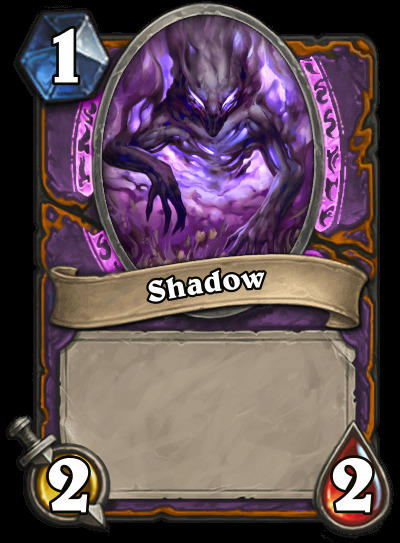 Both its Hero Power and many other cards are able to generate (1) cost 2/2 minions known as Shadows . You can then either play them, or hold them in your hand. 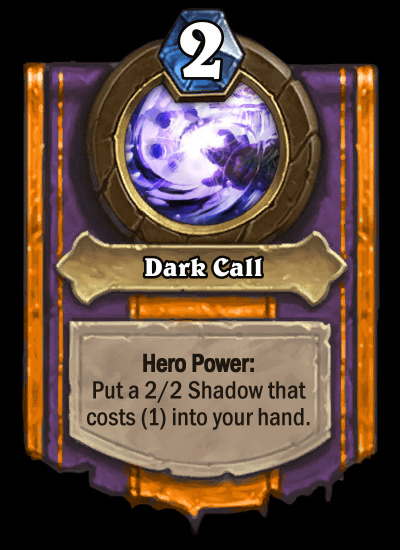 You can choose to play your Shadows more offensively, with cards like Lights Out , or maybe you want to keep them for a while and increase you hand size with cards like Darkblade , to boost other cards that benefit from a large hand. The Necrolyte is feared for their disregard of life. It sees their minion's life as nothing but coal to fuel their own goals. As such, it tends to Sacrifice them to boost its dark powers. 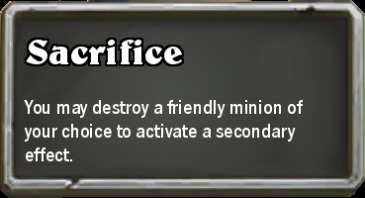 The way it works is, when a Sacrifice card is played, you can choose another minion (if not specified) to destroy. 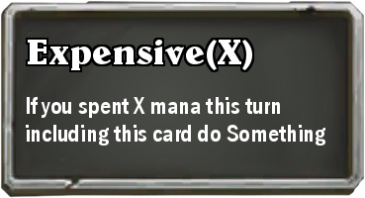 If you do so, the card gains a bonus. 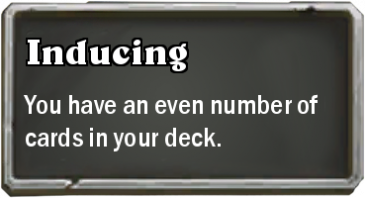 When you play a Sacrifice card, in similiar fashion to Druid's Choose One effect, the following will pop up. Of course, you're not forced to do so, that's up up you. It usually works like a Battlecry, as it activates when the card's played, save for a few instances where it could trigger at the start of your turn, for example. However, not all minion's are discontent with their work conditions. Some of them gain a bonus if they are Sacrificed; others Sacrifice themselves, even. 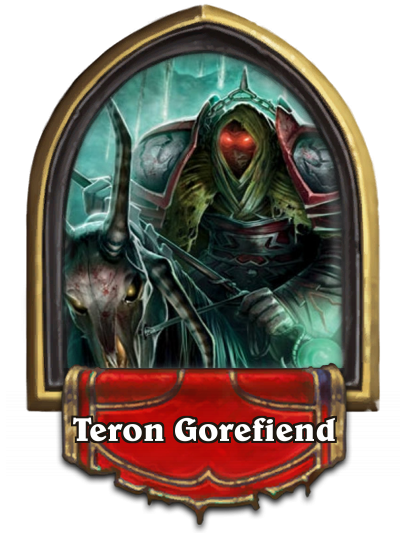 Then there are those, like Deathrattle minions, that would die to serve their vile overlord. Lastly, let's talk about actual shadows. 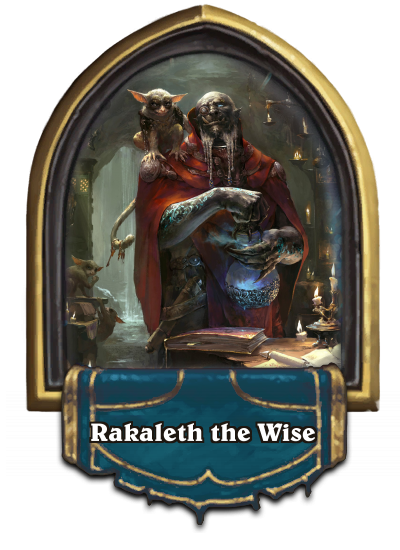 One mechanic present in the Necrolyte's library has to do with card copies. 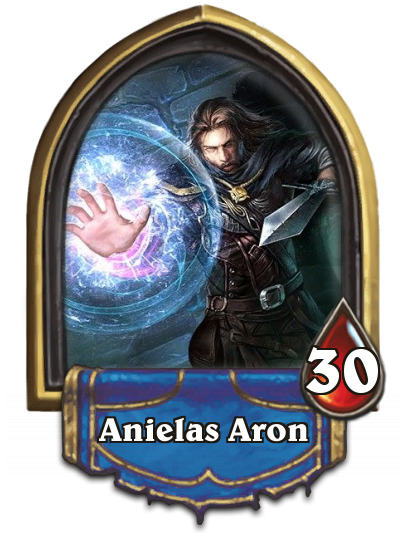 Having a quite powerful card generation ability, it can copy its own cards, or generate new ones, through various spells and minions. Then, many other cards interact with you playing the same card many times in a turn. Take, for instance, Dark Legacy . 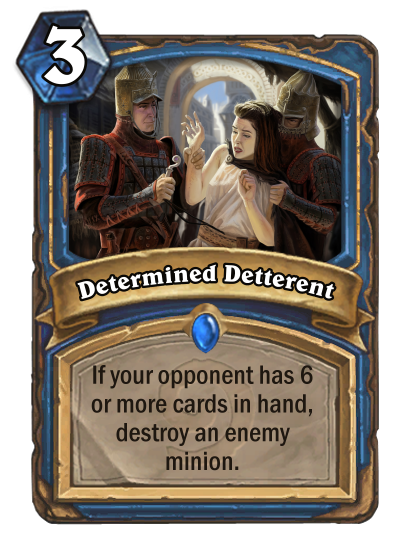 This one's particularly stronger with lower cost minions. The more copies of that next minion you play, the stronger the card's effect will be, and the stronger you board will become. 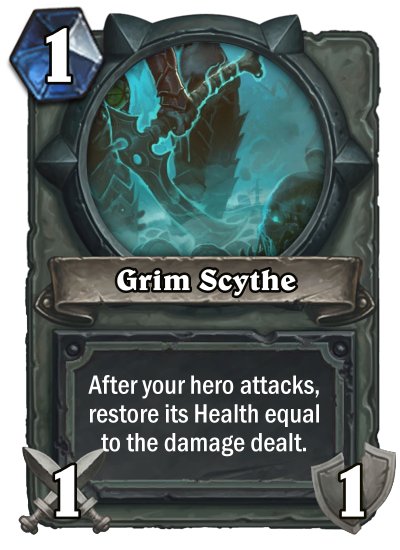 Perfect for a more aggresive Necrolyte. Lights Out: Say goodbye to those pesky candles! 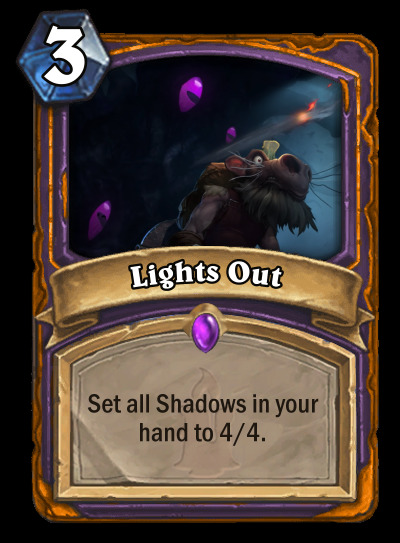 If you're holding many Shadows at once, this is a perfect way to overwhelm your opponent. It also benefits from both a control and aggresive playstyle. 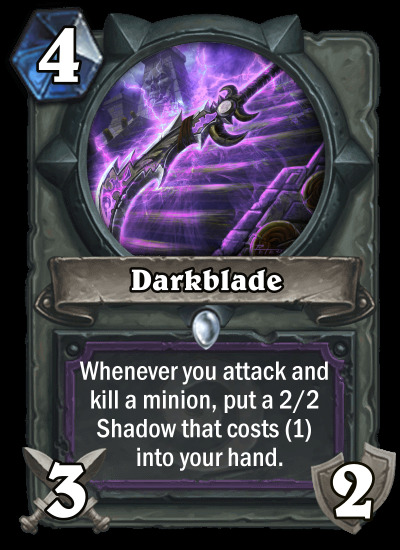 A perfect card for Shadow synergy. Darkblade: A (dark) knight is nothing without its (dark) arsenal. A good tool for board control and to help you fill your hand even more. Dark Rebirth: When a brewmaster is not good enough! Great for playing multiple copies of one card in a turn and Deathrattle and Battlecry minions. 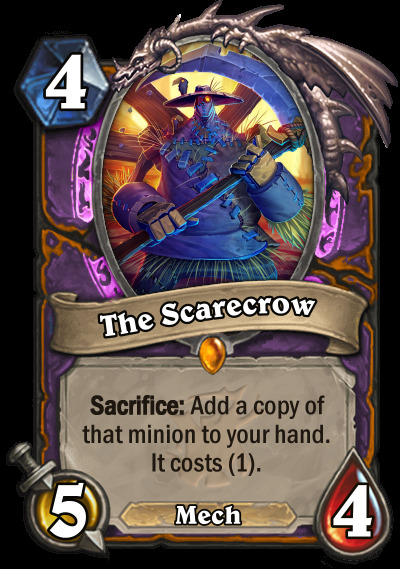 The Scarecrow: Provides a good body and a strong effect when played on the perfect minion. Also helps with filling your hand. 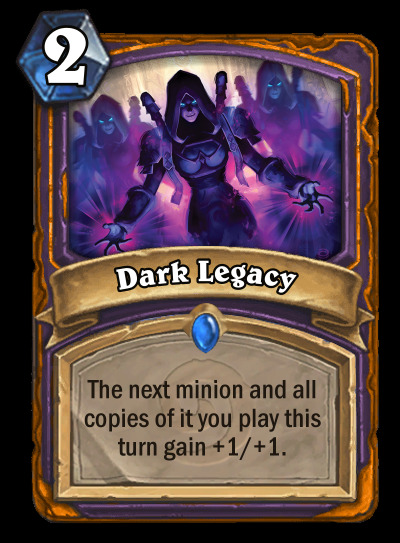 Dark Legacy: If you have many copies of one card in hand, this can help fill your board with buffed minions. Works wonders on Shadows . That is all... for now! Thanks for reading through my submission. Be sure to check out all the entires for the competition and vote for your favourite. Good luck to all! 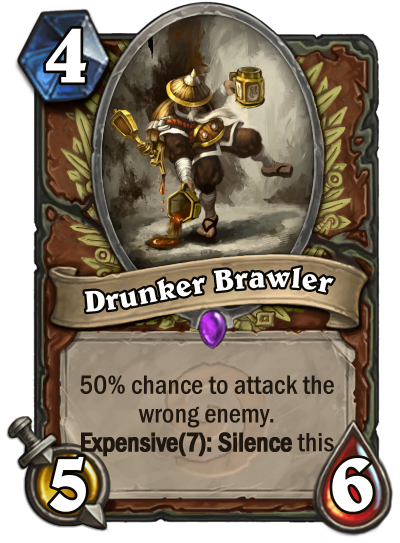 Have you ever just wanted to punch your opponent in the face? How about their minions' faces? Their spells' faces? Weapons'? Well this might be the class for you. With the Fist Fighter, EVERYTHING will be punched in the face, sometimes multiple times, at high speeds. 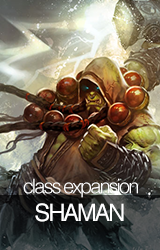 This class has many things to offer; skilled techniques, drunken pandas, RNG, spell generation, tokens, aggro, control, and punches so strong they make your enemies implode into a fine red mist. Who needs some big brains when you can just eat some protein and go wild? 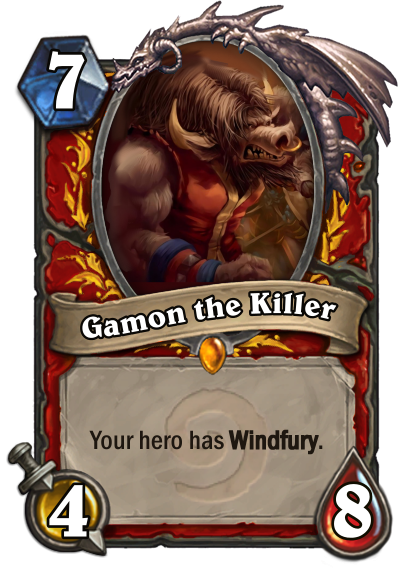 Gamon the Killer: A strong classic legendary that acts as a big finisher for the class, combo this with Left Hook and you can possibly deal 10 damage to the enemy hero's face and keep a 4/8 on the board. It just doesn't end there, if Gamon stays alive to the next turn, there is very high damage potential. 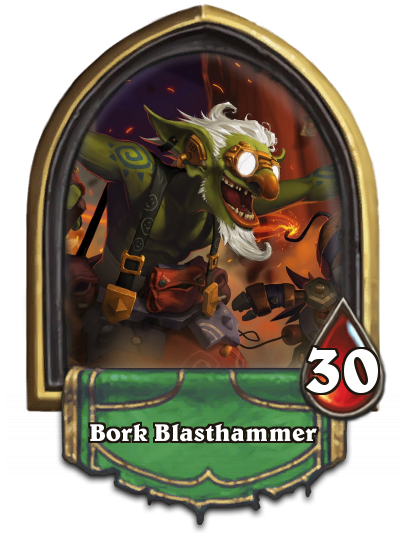 He can easily act as an aggro or control tool, allowing you to deal double damage to the enemy or clear out two minions. Very flexible and clean. 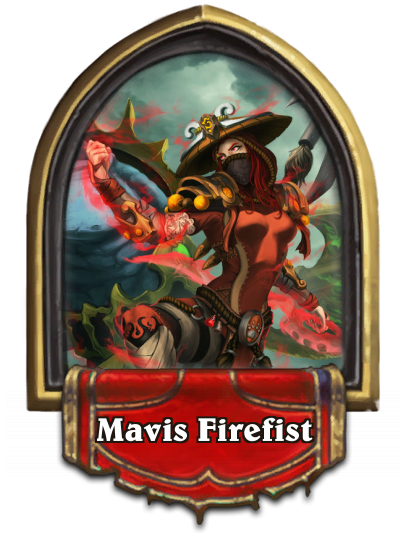 Stonefisted Bouncer: With Mavis being such a favored fighter, she is bound to have some fans. The more fans she acquires from showing off, the bigger the bouncer she will need to keep the board how she likes it. 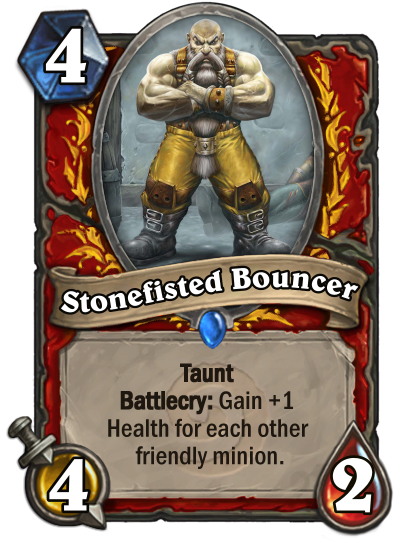 Stonefisted Bouncer is a decent drop if you only have 1-2 minions on the board, and a key card if you have even more. 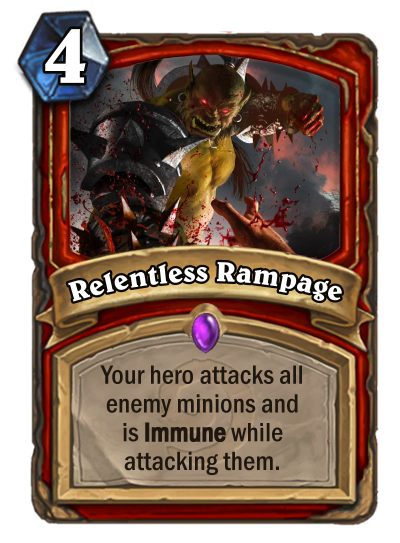 Relentless Rampage: An alright board clear, but requires set up with other cards to get decent value. Strong with the right set of cards, basically Consecration else where. Mind Blown: Lastly, another theme in the Fist Fighter class, spell generation. 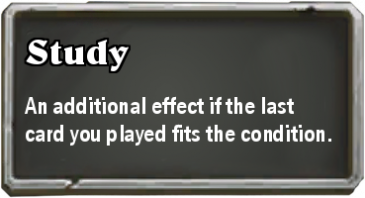 These types of cards allow you to basically re-use your moves again and again during match ups. This is great for constant control and value. 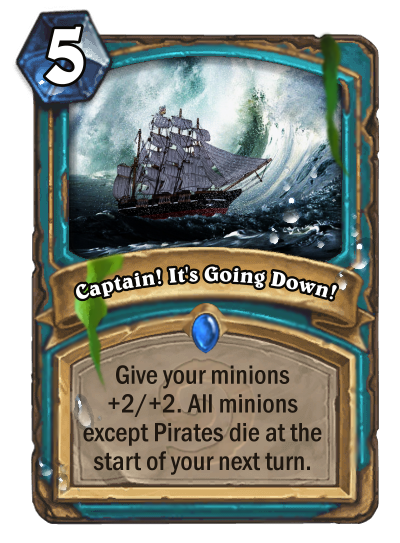 Maybe even a combo deck will come around with this card in mind. We'll just have to see. I just wanted to make a class with strong muscles. Hope you enjoy. Angels as a superior being thinks on a long term plans. they believe that sacrifices must be made in order to become holy and win against the darkness, as such they introduce a variation on an existing concept (Consume), in addition their divine power can ward them against spell damage. 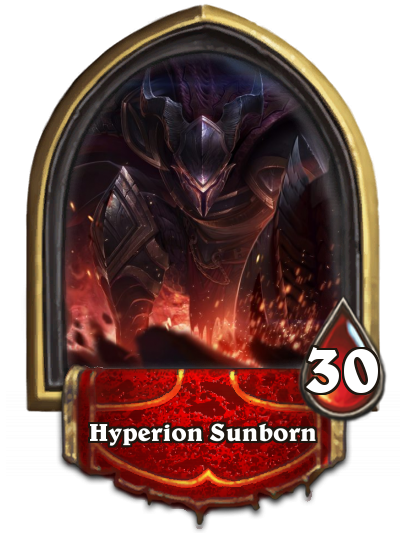 This class has many effects which trigger only on the start of your next turn and they can consume minions to trigger powerful effects, while some consumed minion will trigger a chain combo effect in addition. 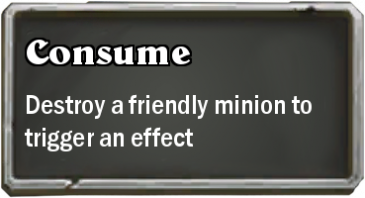 Consume - while destroy a friendly minion is self explanatory, I've decided to make it more clear, all existing cards with Destroy a friendly minion to trigger effect will be changed to Consume accordingly. the main difference is with cards which has effects that trigger has a result of being consumed. 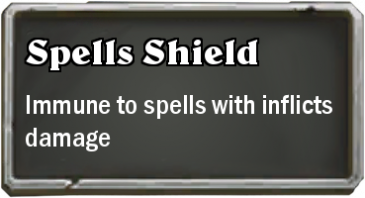 Spells Shield - character with this keyword will be immune to spells which inflict damage, it can still get destroyed,transforms etc... but when ever a damaging spell will hit it, it will do 0 damage. 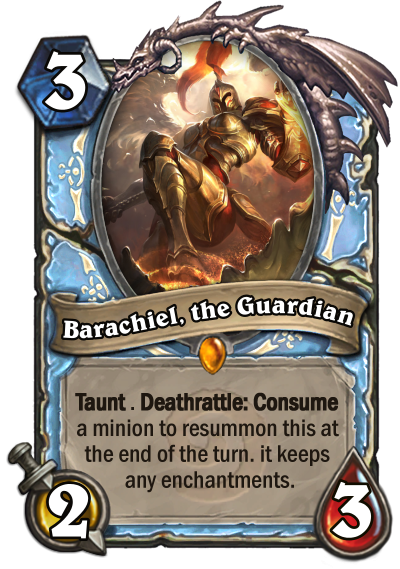 Barachiel, the Guardian -> one of the strongest defensive minions of the angel, due to Taunt the chances to have a second minion to consume is great and can trigger a chain effect, since it's resummoned only at the end of the turn it can protect your characters only once per turn. 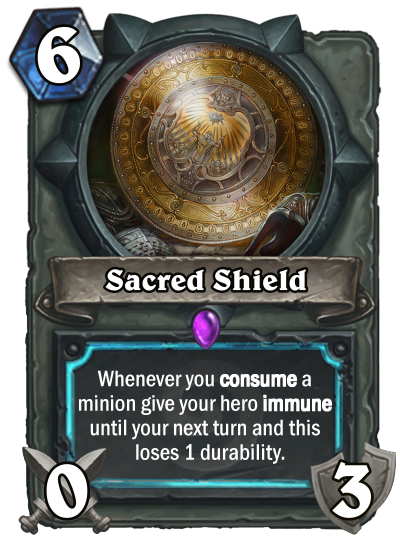 Sacred Shield -> Similar to the Paladin new spells which gives Immune till next turn, with a variation which benefits from consuming a minion. if you consumed more than 1 minion in a turn you will lose another durability without the extra effect of Immune. 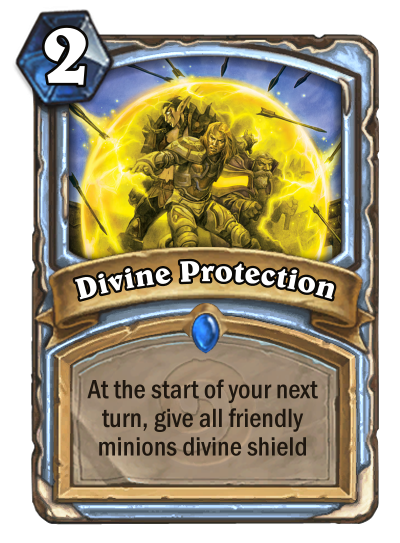 Divine Protection -> can give a powerful boost, but you need your minions to survive till your next turn. 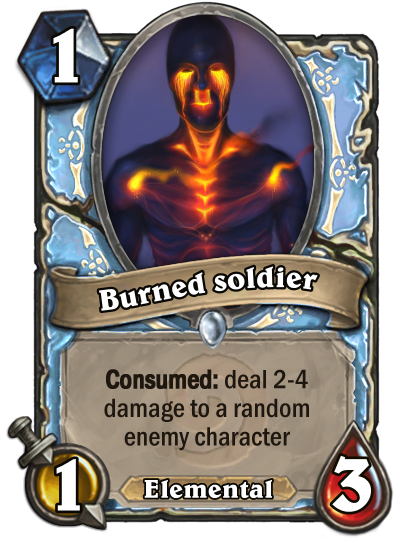 Burned Soldier -> the first example which leverage the fact of getting consumed, so by consuming this minion not only that you trigger the consume effect, but you will also deal 2-4 damage to a random enemy character. consumed cards usually have a lot of health and low attack. 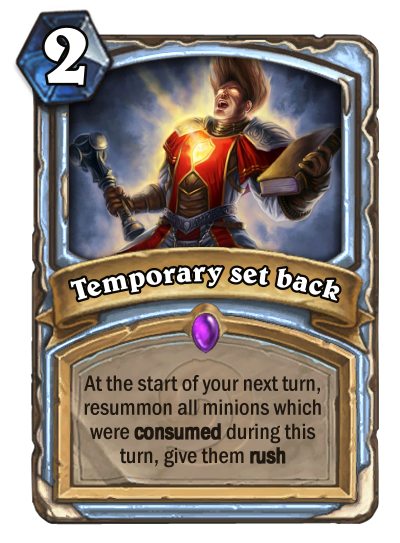 Temporary Set back -> this card show some of the crazy combos that can be achieved with this class. imagine using this card while having Burned Soldier and Barachiel on the field. then you use your hero power to consume Barachiel, he in exchange consume the Burned Soldier dealing 2-4 damage to the enemy character. then with a combination of Divine Protection at the start of your next turn both Barachiel and the Burned Soldier will be resummon with Divine Shield and Rush, and if your original Barachiel survived the enemy turn you will now have 2 on the field. 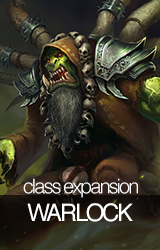 While this class feature two set-back waiting till your next turn and destroying friendly minions, with smart tactics and combination it can leverage from this set-back to surprise the enemy with powerful combinations. The enchanter uses spells, minions, and weapons to weave a magical tapestry. Was there ever a time when you were playing mage and you thought to yourself "Hang on, this class has like, almost no weapons"? Do you want to be edgy and different from other classes (and people), playing cards but like, not in their boring original form? Do you want to play as yet another unnecessarily scantily clad female character created by Blizzard Entertainment? Look no further. As the Enchanter, you can make your opponent really annoyed with your excoriating night-elf-but-not-night-elf emotes, hit your opponent in the face with a magic stick, or cast spells that break your stick because they're too powerful . All that and more after the break. If a Phase card is played a) with a cost reduction, b) in the case of a minion or weapon, a stats buff, and c) in the case of spells, empowered by Spell Damage, it gains a bonus effect. For example, equipping a Leyline Staff from your hero power activates Phase, as you have acquired Spell Damage. These first showcase cards show only a hint of the class; Spell Damage, Phase, and hand-positioning. 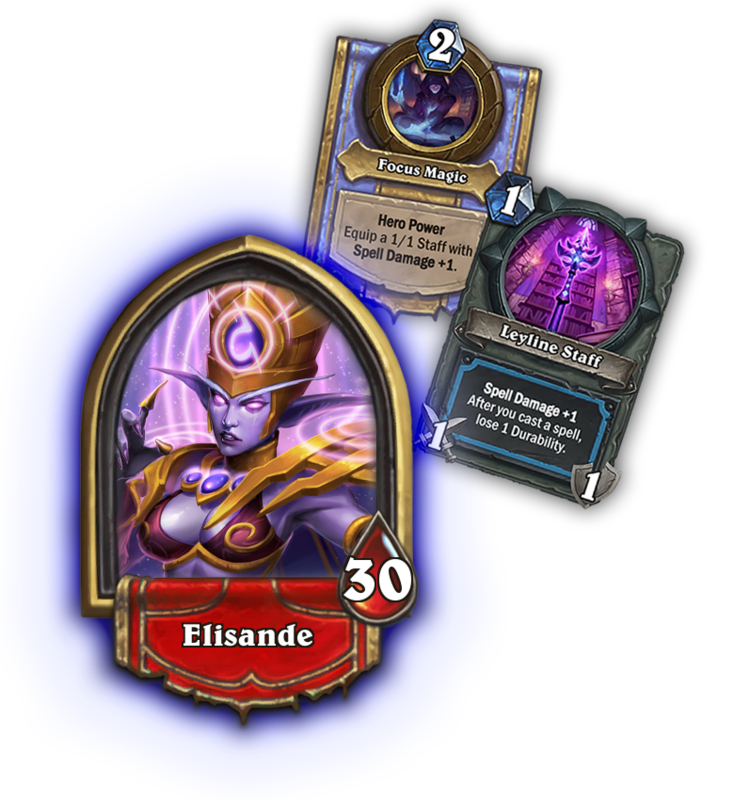 There will be collectible weapons and more impactful buffs for minions and spells, without enabling crazy combos. Leyline Control: Enchanters take great pride in empowering their subjects, and the basic set is no exception. The perfect way to trigger Phase effects on your minions without having to rely on cost reduction. 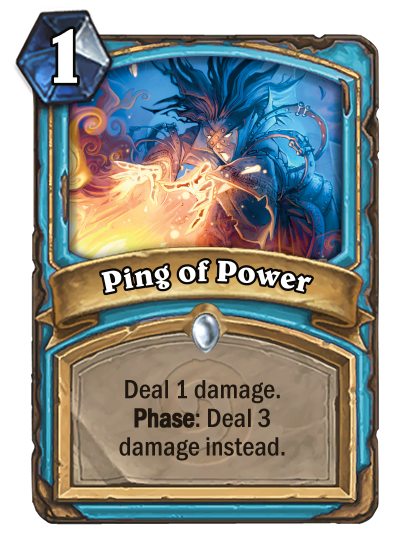 Ping of Power: Comparing this card to Eviscerate, it's easy to see how this might be a powerful card. 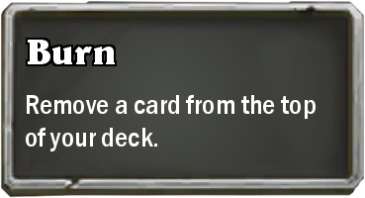 With the use of your hero power, this becomes a 3 mana deal 4 damage combo, an example of one of the limited burn options Enchanter has access to. 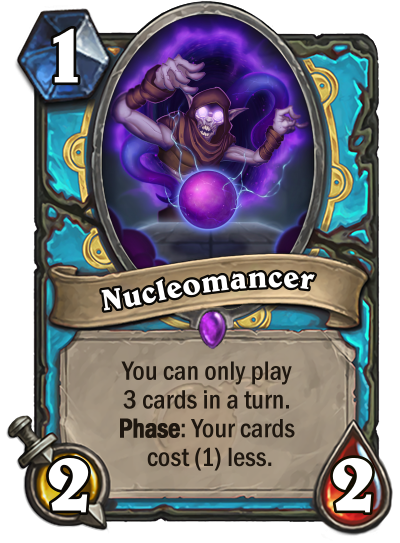 Nucleomancer: Particle Physics is the Enchanter's purview in The Boomsday Project, infusing minions with the power of energetic particles and exploring the very foundations of minion existence. Practically, the Nucleomancer limits your performance while activating your Phase effects and providing you with discounts for your cards. 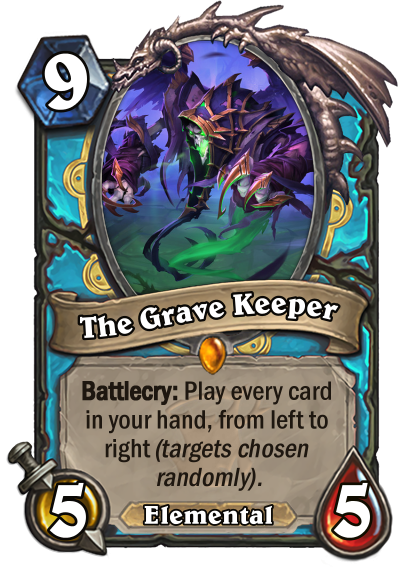 The Grave Keeper: This powerful effect can swing games, and the most important part is that it can require significant set-up to be part of a game-clinching combo which pairs hand positioning with order of play in order to buff minions, clear the board, and burn your opponent down. Noise Machine - Like this! This was supposed to be a tool to help mages focus their spells. It, uh, doesn't quite work. So I re-purposed it to break their concentration and weaken their spells! Some of our toys we keep hidden until the right time! Lab Archivist - Sometimes, our plans and our parts really sync together, and give us something better than we expected! When our last card, or even only card, uses up all our Mana Crystals, it triggers that card's Synchronize effect for a big boost! 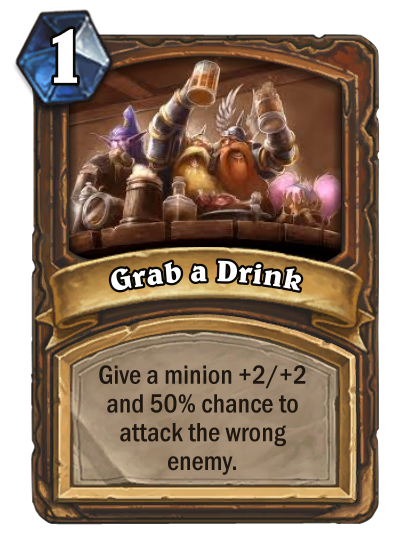 It's like Combo, but usually you'll only get one on a turn. 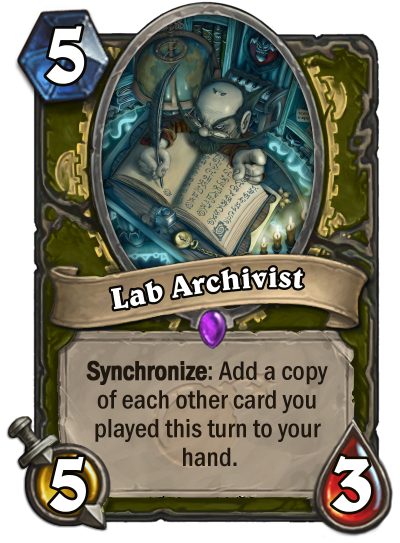 So you CAN play Lab Archivist on the turn it comes out... but come on, you know better than that! 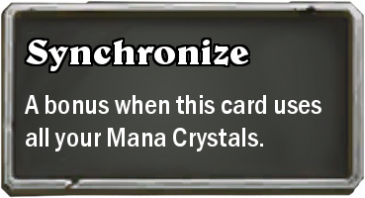 Synchronize effects will give some big value, but the best ones reward you when you played other cards that turn. With our Hero Power and those 1 mana Scrapbots, it's not too tough to trigger an effect right when we need it! 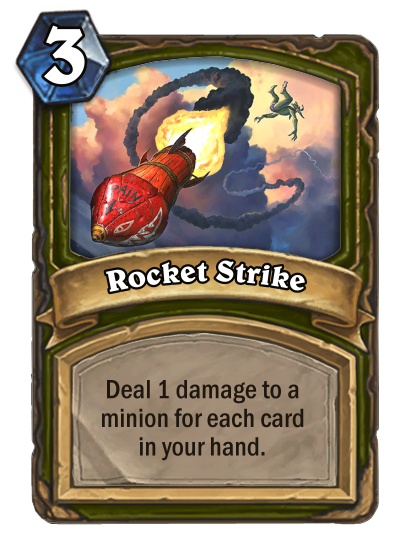 Rocket Strike - We're always bursting with ideas for new inventions! A lot of those end up as Scrapbots. But when you've got a bunch of those, sometimes you can do some really cool things. Some of your cards will be better when you've got a bunch of cards in your hand! 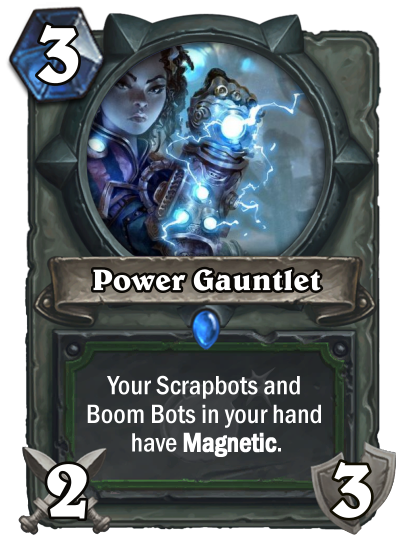 Power Gauntlet - Okay, so now you've got a hand full of Scrapbots. What do you do? Well... you can stick them on other stuff. We've got lots and lots of mechs! Some attack, some protect, and some just annoy people. And uh, heh, I stole a couple of Boom's bots from his lab. He wasn't using them! 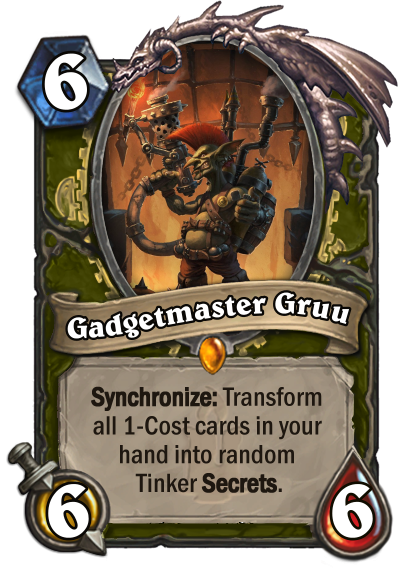 Gadgetmaster Gruu - Oh, that picture? That's my mentor, Gruu! He taught me the most important lesson of being a Tinker. You gotta be resourceful! Think outside the box! You see, we Tinkers are a bit... scatterbrained. As you can tell with all the Scrapbots around here. But Gruu, he can take those bots and make them into new tools for when he raids the kobold mines! We got a couple cards that can transform other cards into other other cards! Between that and our inability to NOT make loads of Scrapbots, we're always a threat! So then, what can we Tinkers do? Well we got tokens that fill our hands and our boards. We got Secrets that disrupt our opponents. We got strong weapons, tech, and mechs to strengthen our side of the field. And when things aren't going our way, we can switch our cards into others and take control back! So, what do you say, kid? Are you in? Once again it's CCC season, and this year I'm bringing the Voidcaster. The voidcaster is a class with heavy control and aggro elements, based around strong removal pieces, decent draw and massive effects courtesy of the classes' signature keyword, Singularity. But first, say hello to Locus-Walker, the first real user of the void's might against the void itself. Not much is truly known about him, and rest assured... he likes it that way. 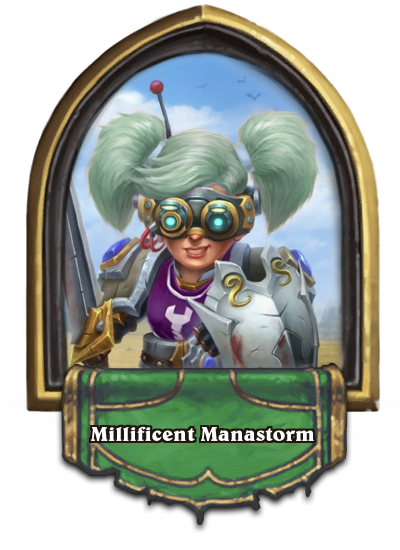 This class summons powerful Singularity minions, plays intense 0-mana Singularity secrets and even has limited access to weapons with Singularity. This is a keyword balanced around locking you into one playstyle for awhile, and somewhat limiting your deckbuilding. You can't play a new Singularity until your previous Singularities have cleared, allowing them to be balanced heavily in your favor. 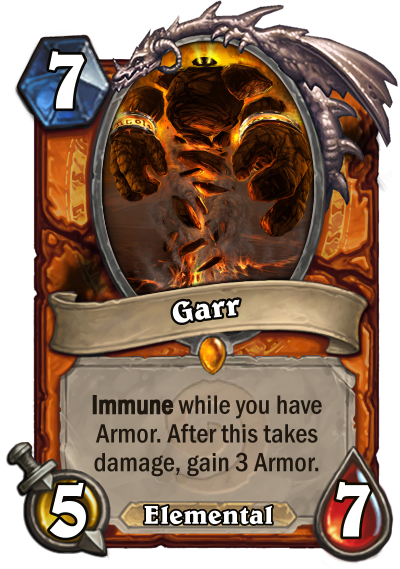 This class also has strong ties to giving your opponent armor; you're liable to give your opponent a substantial armor gain as you are to use it as a resource. 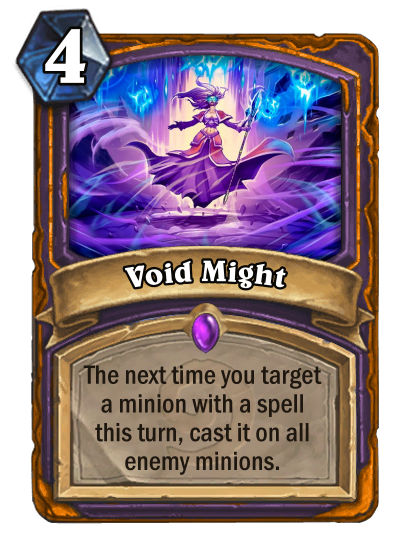 The void's grip extends to all as well, and taking over enemy minions is not out of your purview, though the voidcaster goes about it by instead adding the opponent's minion straight to their hand. Your minions also dance in and out of your hand, through effects that return them to your hand for a single turn. But that's enough Overview, I know what you're here for. 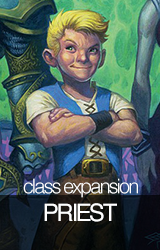 Minimization: I always figured if anyone ever wanted to do another secret class, the secret cost couldn't be 1, 2 or 3. I played around with 4 mana secrets before, but I'd never attempted to balance a 0-mana secret before. Minimization is the first of several dramtic effects that takes your entire singularity count on the battlefield. Is the effect strong? Certainly. Can it lock out your hand? Also certainly. 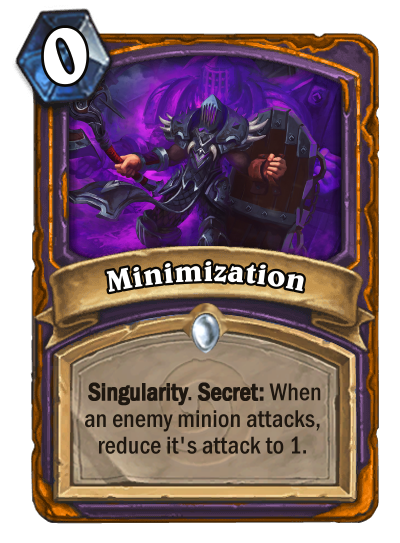 Minimization works partially as a damage mitigator and a removal tool. It triggers on any attack, so it disrupts trades and protects your life total, seeing as this class has limited access to armor or healing. Void Might: The void demonstrates it's strength in flashy plays. 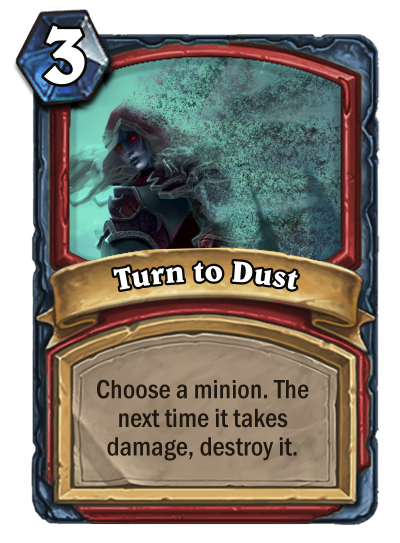 This class doesn't have much access to AoE, so this spell extends your control tools into massive board explosions and mass curse spreading. 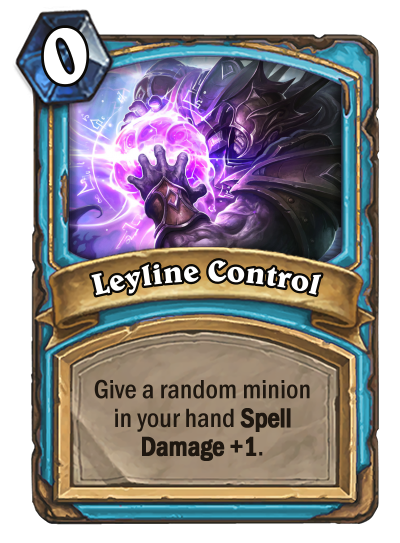 Of course, because of how dangerous this effect is, the class really can't afford to control boards much harder. 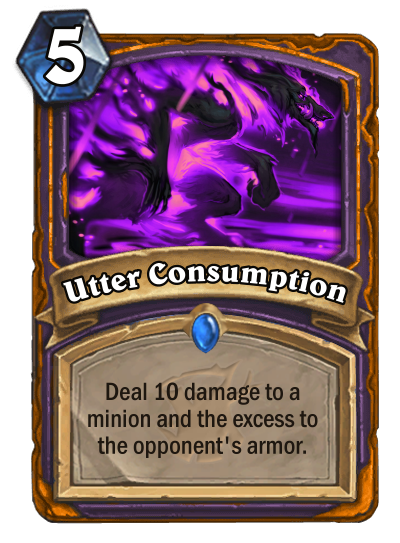 Utter Consumption: 5-mana is the cut-off for when removal becomes hard, and Utter Consumption doesn't dissapoint. 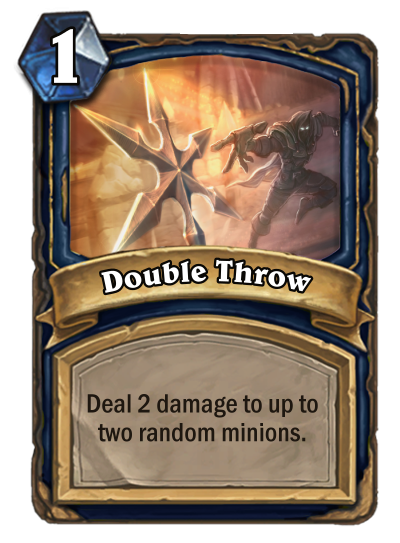 10 damage is more or less comparable to a destroy effect, and past their life total you start setting yourself up for a board-kill on your opponent. 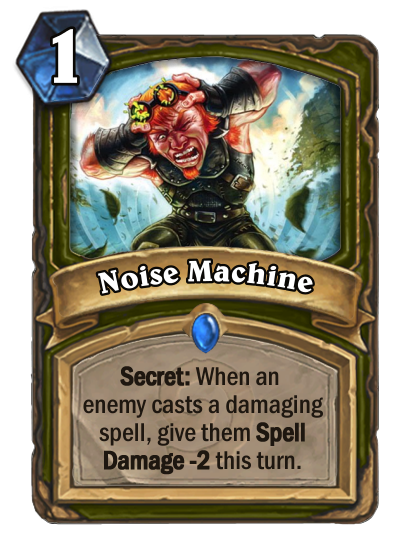 Part of this classes' theme for Witchwood is the use Explosive Runes Excess damage effects which were criminally underused, and this is a good introduction to the sort of damage you can deal with them. 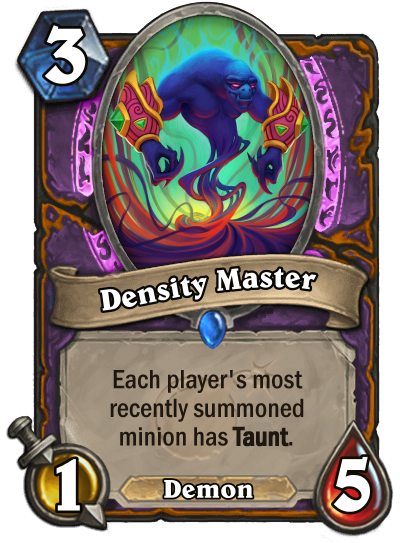 Density Master: Now simply because Voidcaster is fighting the void doesn't mean they don't take their spawn into their fold. 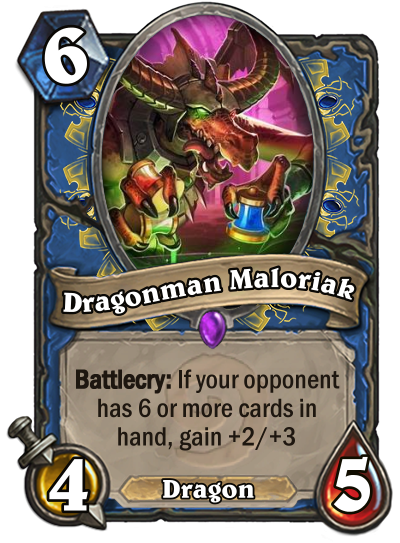 Density Master is part of the Voidcaster trifecta of races: Demons ( Voidwalker s), Elementals ( Meteor s and Crystal giant s) and Dragons ( Nightmare and Twilight Dragon s). 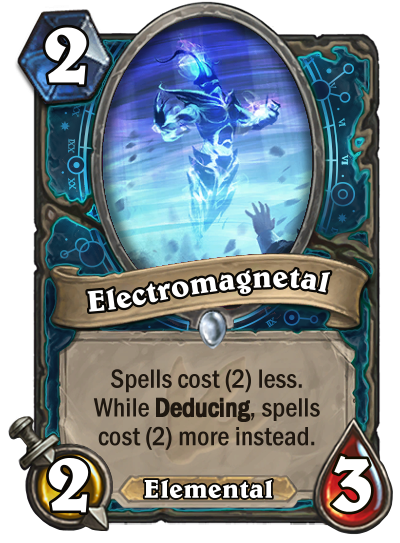 Density Master also ties into two more things VC defines itself on, being equal oppurtunity effects that trigger on both players turns and the constant swapping of minions on the board through swapping abilities. Of course, it also represents the control aspects, turning all your tokens into tiny walls up until the voidwalker itself becomes your last played minion. 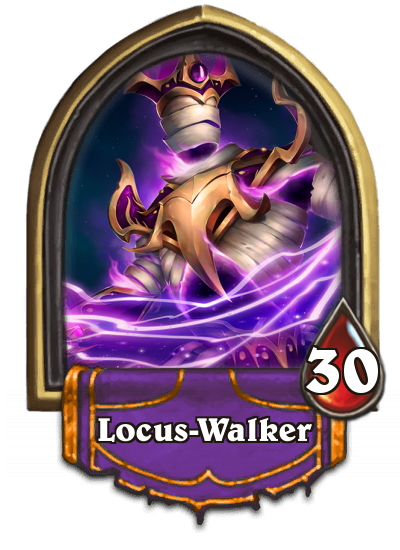 Alleria the Voidshot: Locus-walker is not the most famous user of the Void. That would be his student, Alleria Windrunner. Yes, the hunter hero. 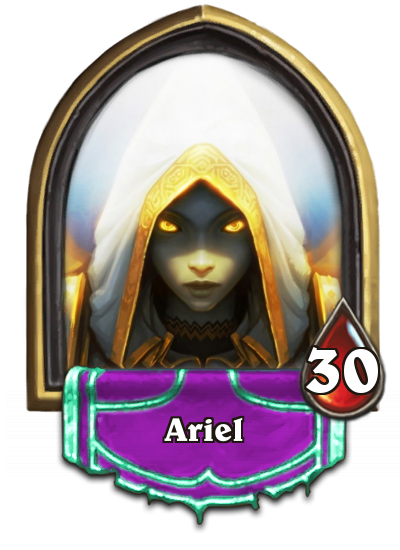 But here, she shows off the massive potential of Singularity minions. 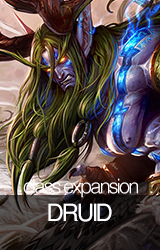 Alleria herself is merely a slow King Krush, massive and unstoppable (Unless you have the Twisting Nether , because that's hilariously thematic), but more important is her effect. 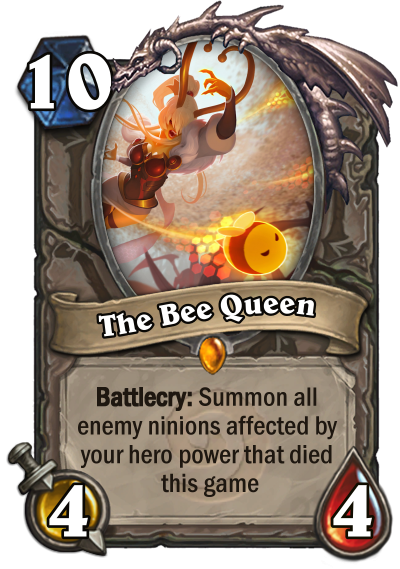 She completely removes your hero from the board for a single turn. 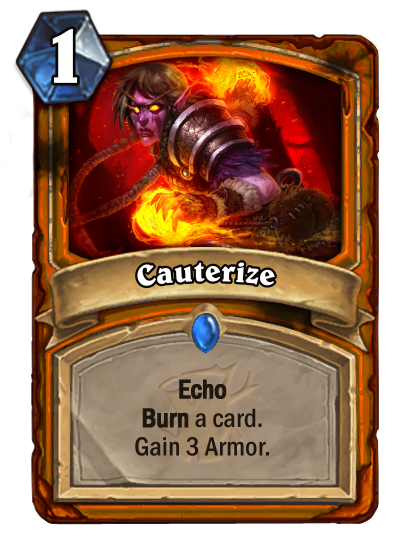 She's the last of the cycle of Voidcaster card that dance friendly and enemy minion alike in and out of your portals into your hand. 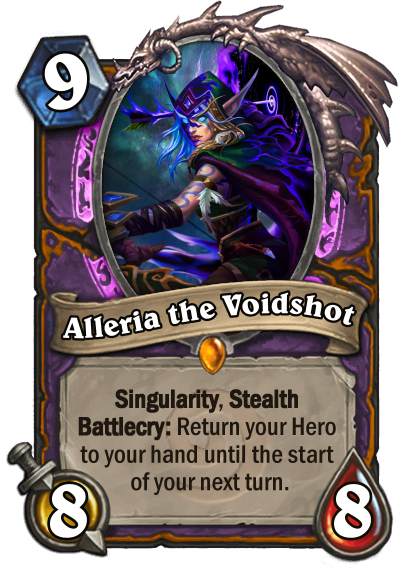 Alleria the Voidshot is the ultimate survivalist, and is adept at causing your opponent suffering. 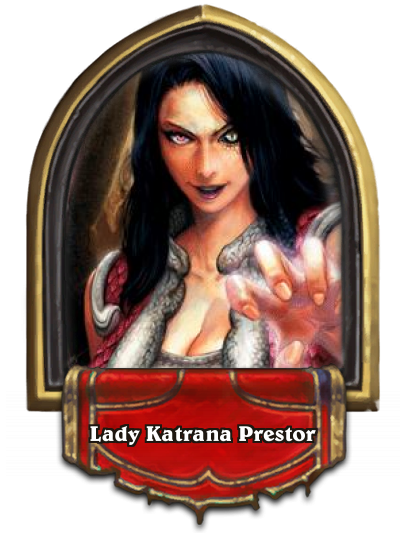 Plus, like all classic legendaries, she drastically changes the boardstate. But, she cannot interact with any of your other Singularity minions or Secrets, so be careful what your board looks like when you need to call on her aid. (Also if your hand is full, she'll destroy your hero, so just be careful with Shudderwock . Otherwise you're fine). You keep all damage you had currently and you can't replay your hero. If you guys want some more facts about Singularity, what I can tell you is no effect can cause two Singularities to be on your side of the board at once. 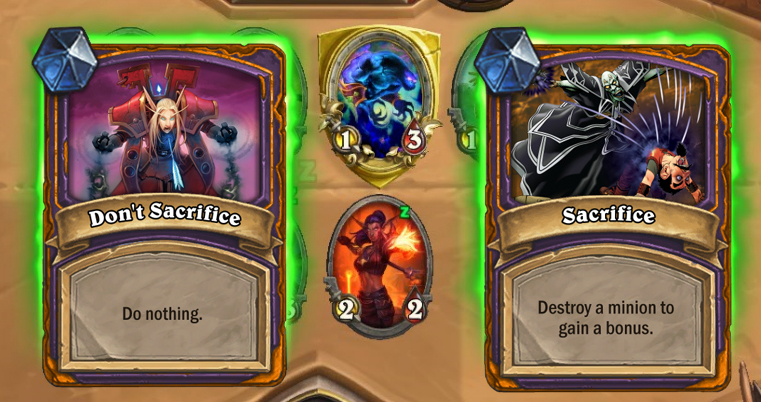 Evolve cannot create two at once, Mad Scientist can't add an extra secret from your deck and if Scroll of Wonder already gave you Singularity secret, it cannot give you another. 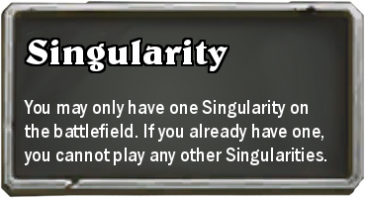 It's not even that affects get countered, they completely ignore th possibility to create another Singularity card. There would essentially be a switch that prevents any extras coming in, and that's read before the effect goes forward. I hope Voidcaster interests y'all, and I'm hyped to see where this contest goes from here! Wait you don't know what expensive is? Well here it is. 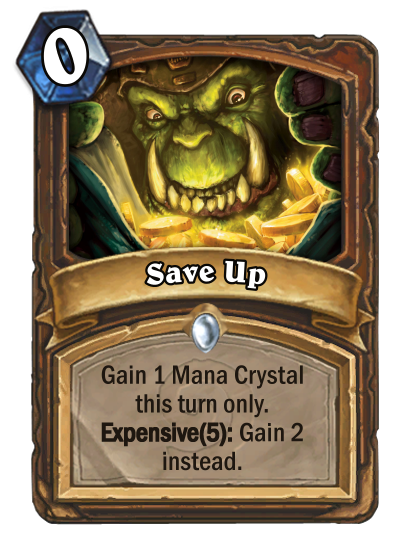 Save up - Can be a pre-nerf innervate but it isn't as OP as you can't ramp beyond your Mana curve. 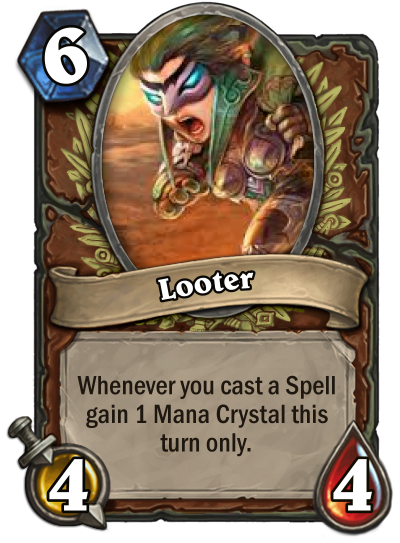 Looter - Another theme of this class is miracle with all those cheap spells. Grim Reapers are malignant spirits that control undead bodies. They cloak their possessed bodies with rags, and they arm them with a scythe imbued with part of their own mystical energy. These scythes are known to rend horrible wounds that heal only slowly and often become infected. Dread and fear are the things the spirits are looking for. It is assumed that the spirits feed on these emotions and also on pain and agony. 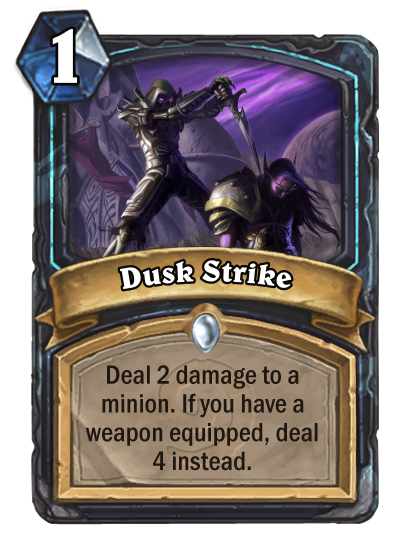 Dusk Strike (Classic): Removal that benefits from weapon, one of the class traits. 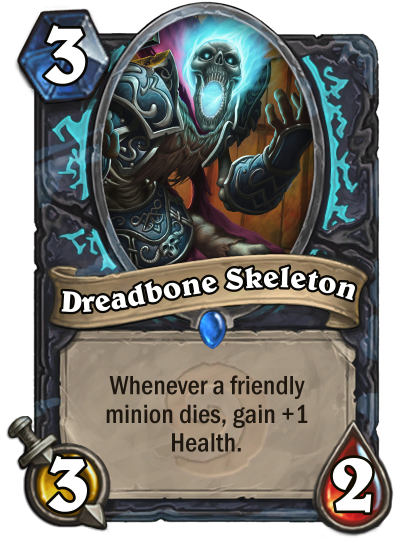 Dreadbone Skeleton (Classic): An introduction to a familiar effect of the class ("whenever/after/when ... dies"). 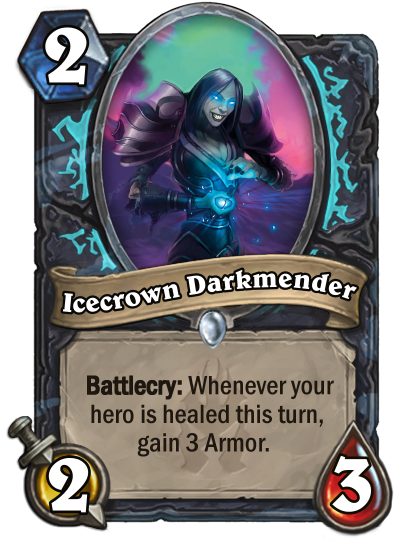 Icecrown Darkmender (KoFT): Synergize with the hero power's weapon and also lifestealing can get a bunch of armor. 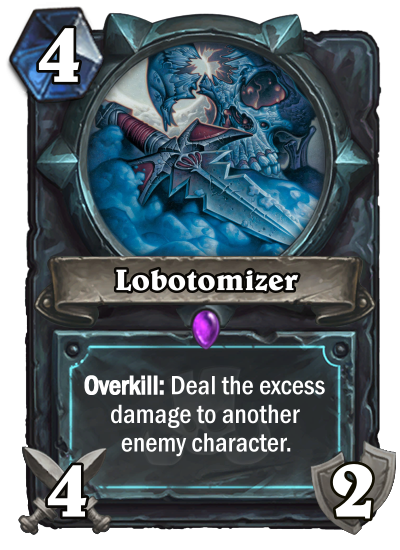 Lobotomizer (Rastakhan's Rumble): Value card, as you can attack a 1-Health minion and deal randomly the missing 3 damage to the enemy hero or to another minion. 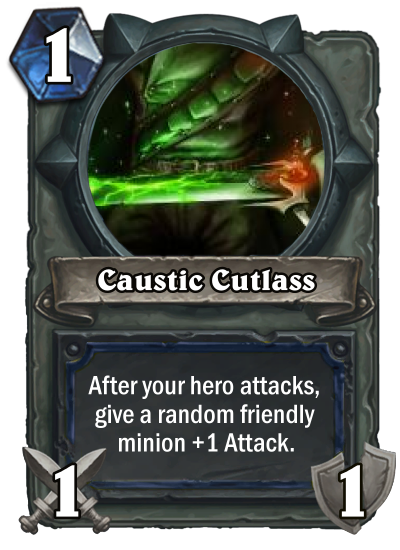 Increasing this weapon's Weapon is a great way to remove big minions by attacking weak minions (unless the damage goes face). 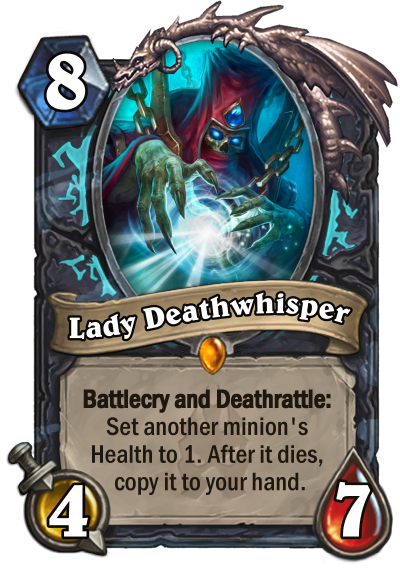 Lady Deathwhisper (KoFT): Awesome for control matchups. 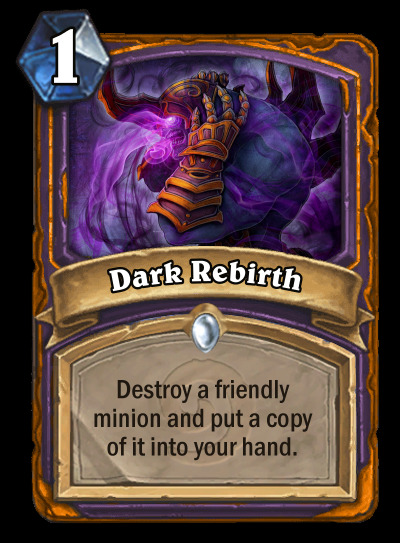 It enables removing big minions and can add a copy of it to your hand, so it's a partially removal and also a value card. That's it for now! Good luck to everyone! Hold on. My experiment is just...perfect yes perfect...as all things should be...just need to align the results just as so...fantastic. Yes...perfect...perfect...perfect...pulchritudinous success. Hm hm hm...quite an intriguing hero power yes? From the start of the scientific method, we grant educational guess on the laws of nature, and then we begin to research, giving expert results like no other. Perhaps, I shall elaborate further. 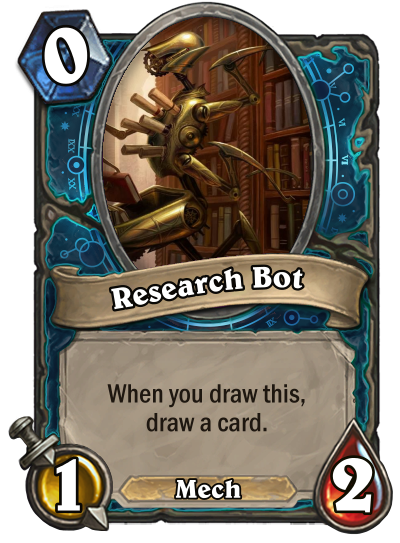 My hero power allows me to make my next card drawn a Research Bot, authorizing me to draw an extra card. Essentially, I just obtain an extra 0 mana 1/2 on my next draw. Alone, it is just simplified as "Summon a 1/2 Mech next turn", but the possibilities my adepts! Elementary Deduction: We scientists always deal with Elements love. The compounds of the natural world make everything! 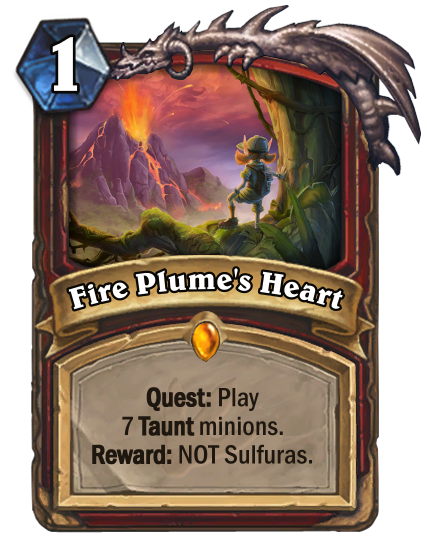 But alas, Elementals? Quite interesting formations...something to Deduce no? Speaking of Deducing, this is an excellent example of such a mechanic. While Deducing i.e. 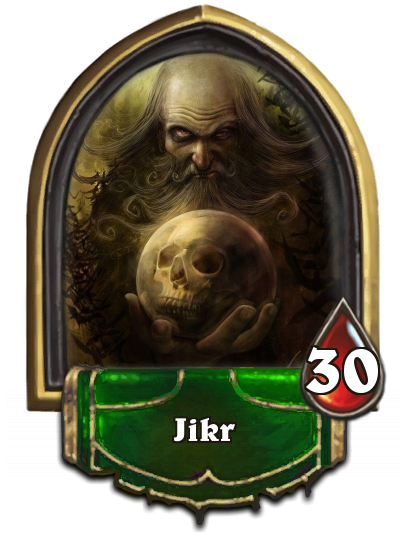 having an even number of cards in your deck, both players spells are reduced by an hefty amount. 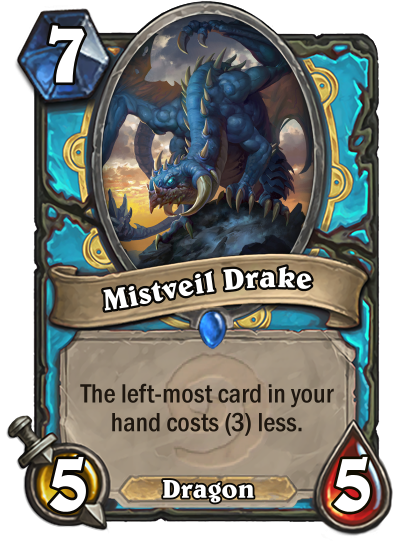 But if you can align your hand apparatus to be even, your opponent will have quite the annoying spell nullifer to deal with. Genius Species: Speaking of Elementals, we also carry Mechs. A plethora of intriguing creatures these are yes? Our Biologists are quite curious about these Hearthstone "Races". A Race is a minion's subtype; for example, Totems, Beasts, Elementals, you name it. 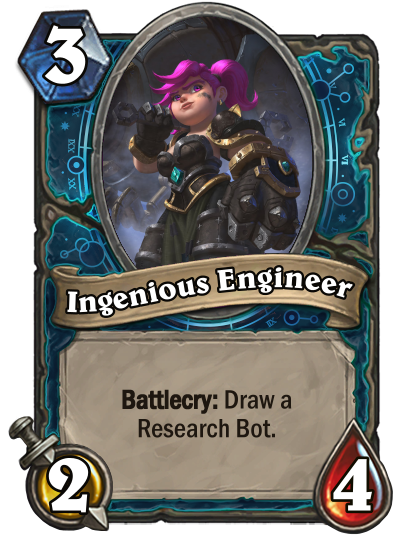 With the power of this brilliant scientist, you could buff all of them to form a formidable Zoo deck. Or, you could simply buff your Research Bots. Whatever works honey. Ingenious Engineer: However, there are other uses for your Research Bots too. 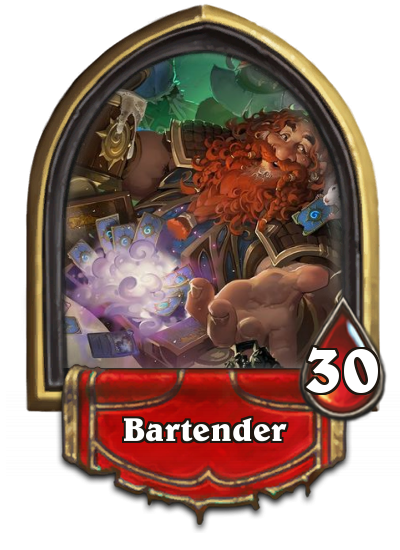 A mega-cycle or a theme within my profession are 2/4 gnomes with a draw effect. 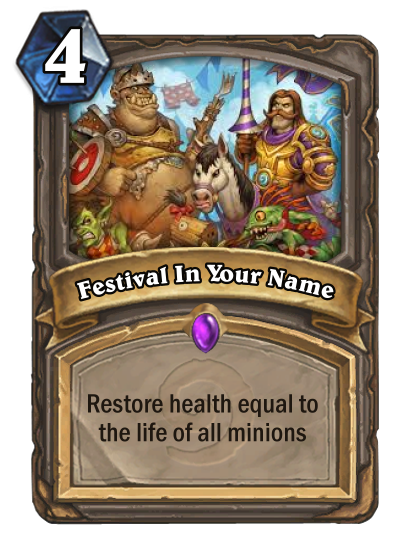 Each expansion has a common one! They are quite gifted little ones aren't they? 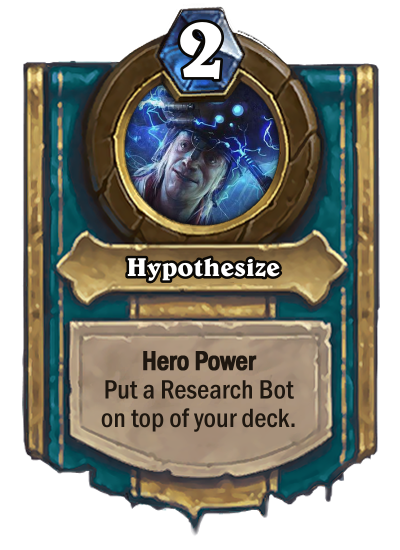 This one in particular allows you to draw a card under the condition that you've used your hero power or other cards that shuffle Research Bots into your deck. It also grants you the usual 1/2 Mech and provides an efficient means to an end. Experience Experiments: But ah, Research and Hypothesis are just the tip of the iceberg. The real center-piece of science: Experiments. Your opponent will have to play well against tests that you set up for them, and you can toy with the manipulated variables by creating an even number of cards in your deck to enter the Inducing state. In an Inducing state, powerful minions can be vaporized in an instant. But if you wish not to take a stance, you could shuffle a useless minion...say a Silver Hand Recruit , for your opponent to draw later. Of course, they could shuffle a key minion. Tread carefully and play your cards right. 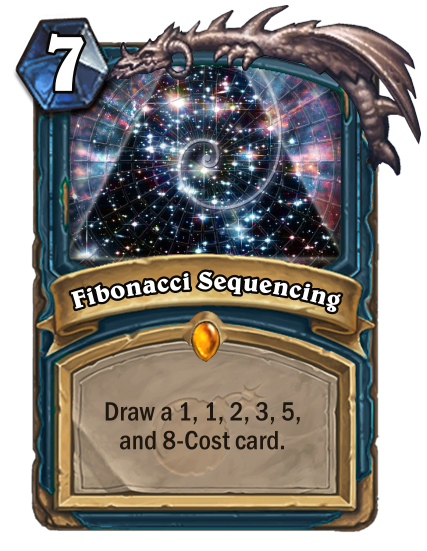 Mathematically Sound: You might be wondering what field of science a Scientist class might use in the Boomsday Project. Well, it is but the language of science... Mathematics. And what better way to utilize the power of raw numbers with this spell based on a rather famous mathematical set? 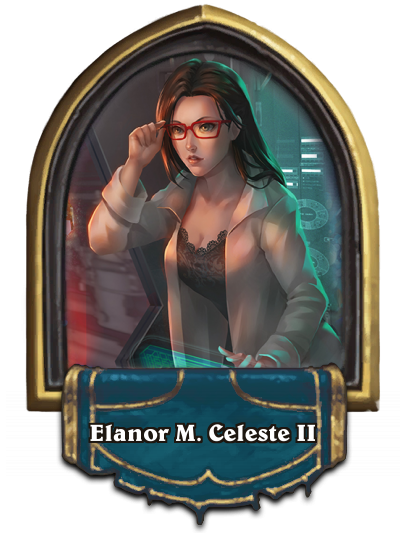 After all, Scientists uphold a plethora of expensive yet potent cards after; our collection includes spells costing 8 or more with effects that are game-ending and will revolutionize the world with illustrations of phenomena stretching from Supernovas to Pandemics. 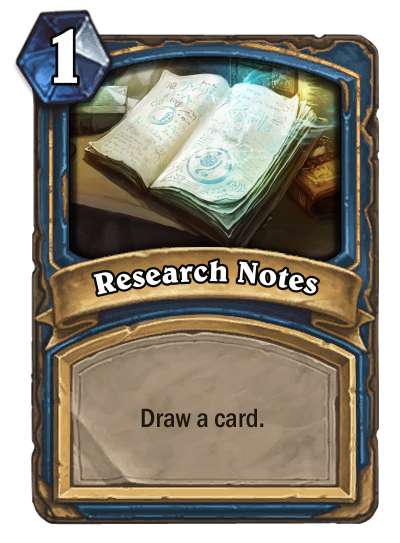 Indeed, expect more science puns and theorems to be depicted in cards. Oh, it looks like our time is up, relatively speaking of course. A shame. But the future is the focus. To innovate for it. To build it. To explore it. Indeed, big spell synergy as well as cards that shuffle the lowest cost minion in your hand into your deck await you. I hoped I have entertained you with my laboratory and expertise in fields not tread before. I'd like to thank Demonxz95, Pircival, Tox, Teknician, skellybarrel, ZeldaFreak, Phoenixfeather, Ragnador, Muhframos, Bobslime, Samwise, Walrus, and so many more for helping me create this class. If you wish to see what is to come in future expansions...look no further. And have a wonderful, elementary day. Running short on time here, so I'll keep it brief. Presenting, the Firelord class! 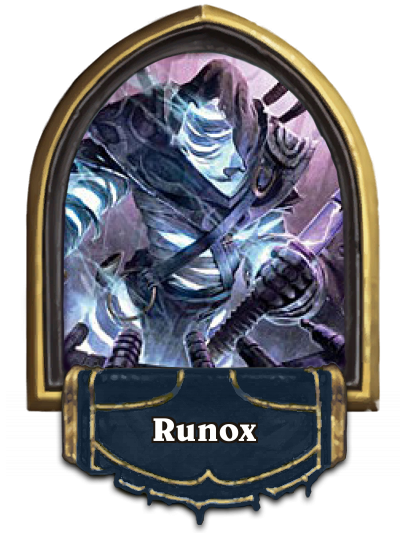 The custom borders were made by a fantastic CustomHS subreddit moderator and friend Logovaz. 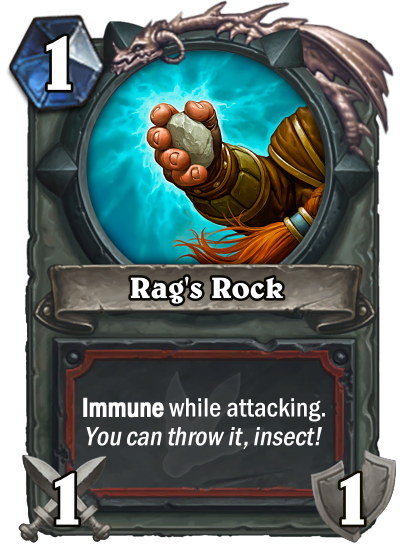 INSECT! NO ONE PRESENTS MY CLASS OTHER THAN I , THE FIRELORD! NOW THAT I HAVE YOUR ATTENTION, I WILL TELL YOU ABOUT MY HERO POWER! IT IS BETTER THAN ALL OF THE OTHERS. IF YOU FACE ME, YOU WILL AUTOMATICALLY BE AT A DISADVANTAGE! HA! OH, OF COURSE! 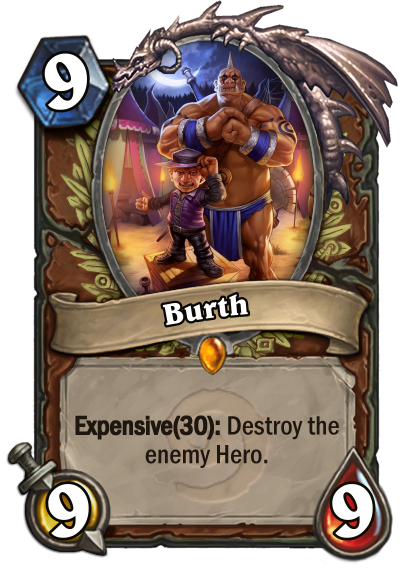 I NEED TO TELL YOU ABOUT BURN, INSECT! 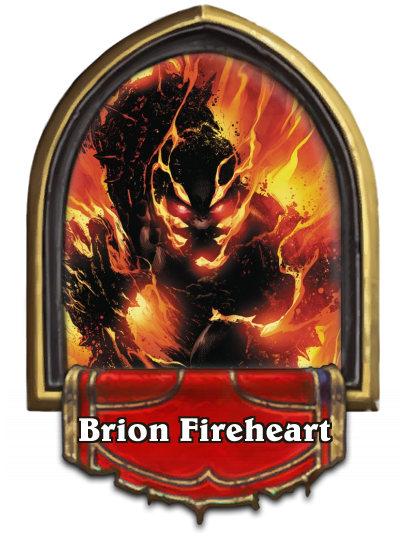 BURN IS THE FIRELORD'S CLASS KEYWORD, AND IT REMOVES THE TOP CARD OF YOUR DECK! 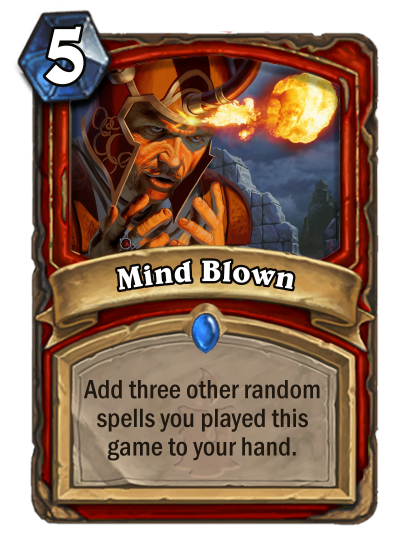 IT IS JUST LIKE WHAT HAPPENS WHEN YOU DRAW WITH 10 CARDS IN YOUR HAND! MY CLASS IS DESIGNED FAR BETTER THAN THE OTHER 9, SOLELY BECAUSE I AM IN IT- BUT, THERE ARE OTHER THEMES AS WELL! I DARE VENTURE INTO THE UNEXPLORED DESIGN SPACE WITHIN THE DECK, VIA DRAWING, SHUFFLING, AND BURNING CARDS! I HAVE MASSIVE MINIONS, EVEN LARGER THAN C'THUN, AND THOSE PESKY JADE GOLEMS! AND THE BEST PART- I HURT MYSELF! A LOT! WAIT, THAT CANNOT BE RIGHT. I DEMAND TO KNOW WHAT INSECT DISGRACED ME WITH THEIR AMATEUR CODING SKILLS! NOT ONLY AM I THE BEST CLASS, BUT THE MOST UNIQUE ALSO! ANYONE WHO THINKS OTHERWISE IS WRONG, AND WILL SOON BE DESTROYED. 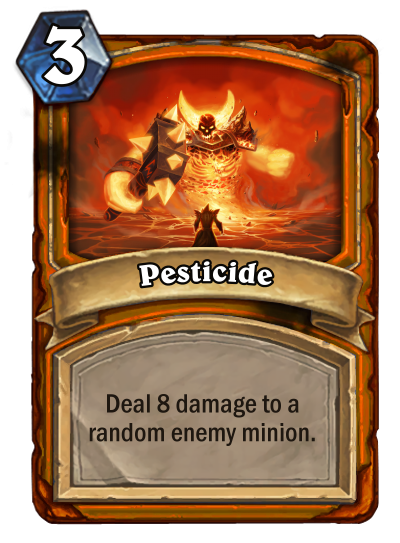 ONE LAST THING, INSECT! 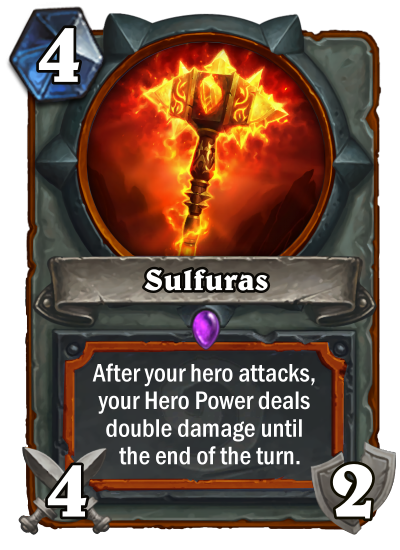 IF YOU HAD THE AUDACITY TO QUESTION MY ACQUISITION OF THE LEGENDARY HAMMER SULFURAS, LET THIS NERF SERVE AS A WARNING TO ANY OTHERS WHO DARE STAND IN MY WAY. The Engineer loves to buff its minions and reflects this with their class keyword: Enhance . 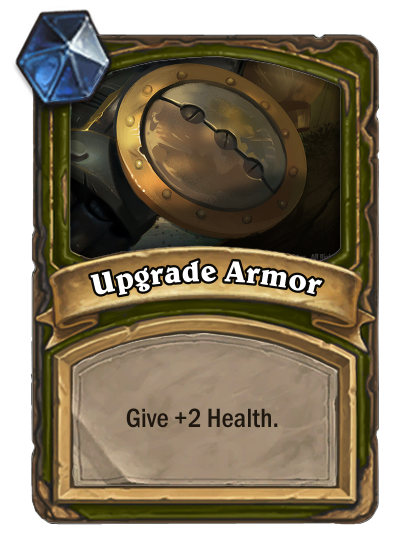 When a minion is Enhanced , you get to choose between giving it +2 Attack, +1/+1, or +2 Health, meaning you can push your minions' to either trade up, survive, deal damage to face, or just become generally more resilient. 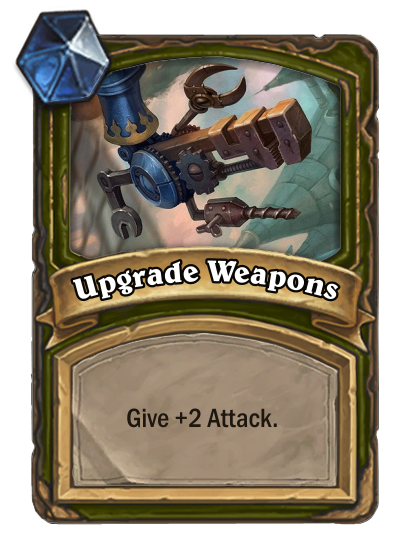 Engineers can also "Upgrade" themselves by gaining Armor and equipping Weapons. 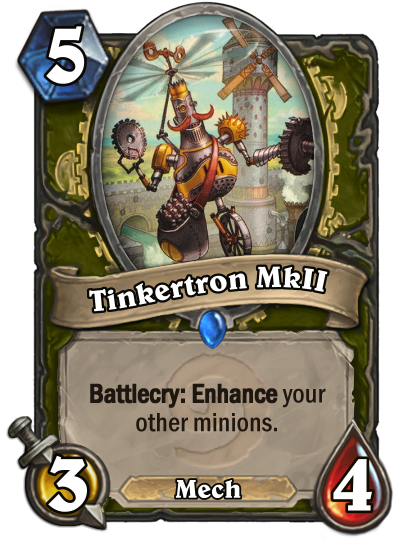 Engineers can go wide, leveraging multiple minions for mass buffs with the Tinkertron! True to their calling, Engineers are equipped with a variety of wacky machines to serve their needs. A common theme among them will be effects that trigger each turn to produce long-term value. Careful: Some Inventions may explode! 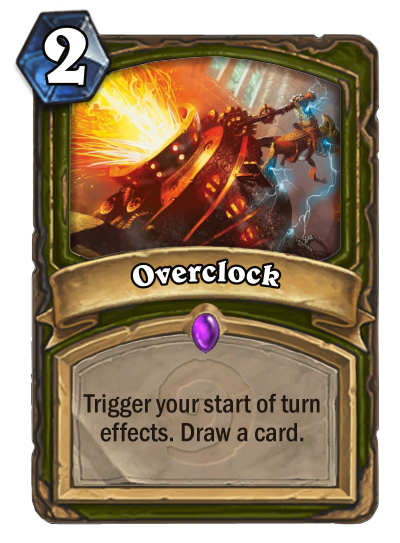 Overclock lets Engineers speed out the value effects of several cards, it's almost like taking a second turn. Almost. 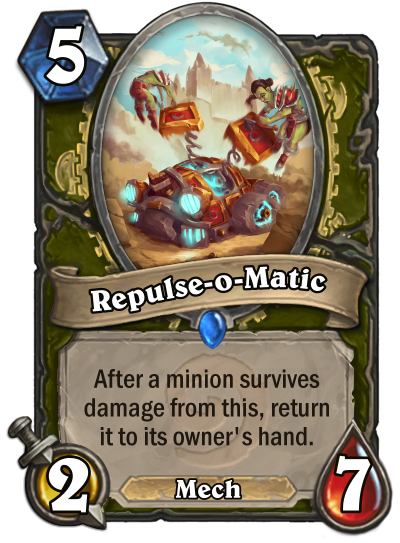 Meanwhile the Repulse-O-Matic is a powerful defensive tool - Taunt it up to make it a massive pain in your opponent's side. Smaller minions get pummeled, while bigger ones get knocked back to your opponent's hand! Lastly, Engineers are a wily bunch - their wits allow them to overcome tricky situations with a flash of genius. Engineers can mulligan away cards from their hand in search of more, greater ideas. 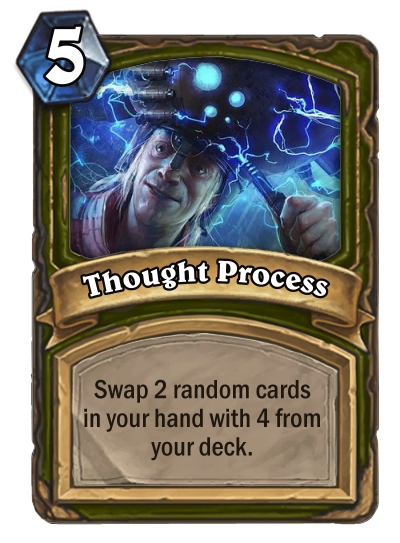 Thought Process lets you turn a useless hand into a useful one - put those expensive cards back in your deck and dig for cheap ones, or vice versa. Who knows, maybe you might even trigger some effects in the process. Don't have any cards left to shuffle in? No worries, an Engineer never runs out of ideas - that's 4 fresh cards with no drawback! 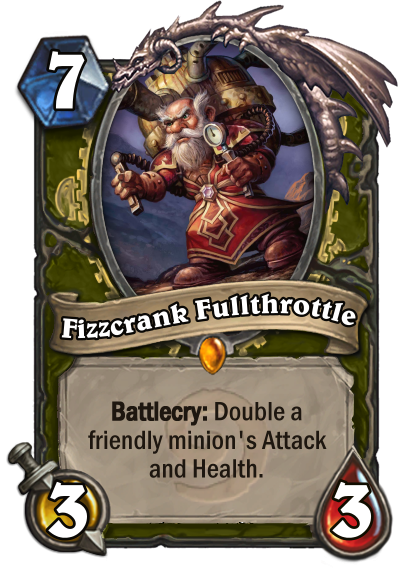 The Engineer's Classic Legendary is Fizzcrank Fullthrottle - he requires a reasonable amount of setup to get high value but can easily lend you the necessary punch to finish off a foe. Watch out for rocket-powered boars! I'm going to tinker with this class over the coming months. There's a lot of work to still be done, especially when it comes to carefully crafting the armies of robots, exploding machines (whether they're supposed to or not), and wacky experiments. 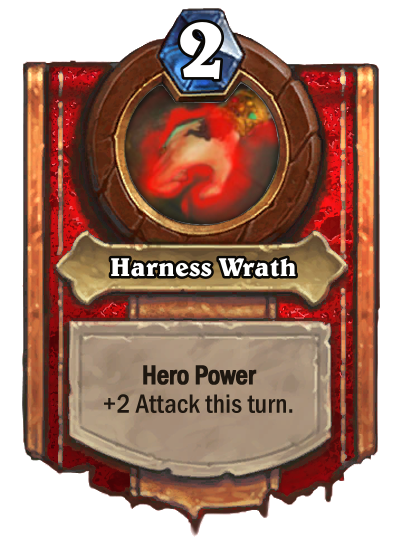 Although several cards display the Mech tag - this tag technically won't exist until GVG "Releases" and as such the class will not have any Mech synergy in the Basic or Classic expansions, although it will be a recurring theme in the future. 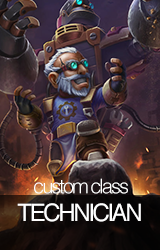 Like the Hunter or Rogue, the Engineer is NOT a Healing class. While they may on rare occasion receive an invention that allows them to restore Health over time, these will be rare exceptions. Lifesteal will not appear on Engineer cards. The Hero Power refers to Contraptions - a handful of cards will help you summon more of them. Some Contraptions may be bigger than just a 1/1, and some may even sport keywords depending on what summons them. Some Contraptions may have slightly modified names such as "Rusty Contraption" or "Colossal Contraption" - these will all still count as Contraptions. 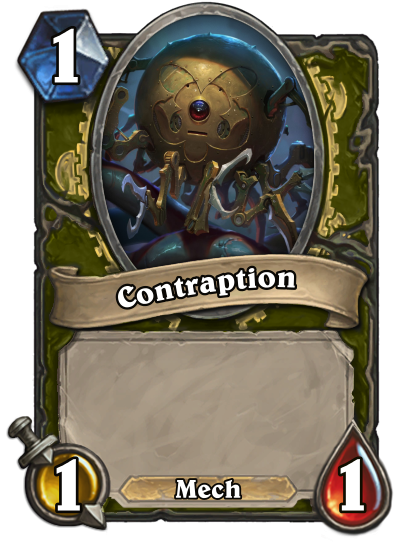 All Contraptions are Mechs and have the same art. No Contraptions will have hidden effects which require the opponent to hover over them to see what they do - they're exactly what you see on the tin and can be recognized by the art that they share. 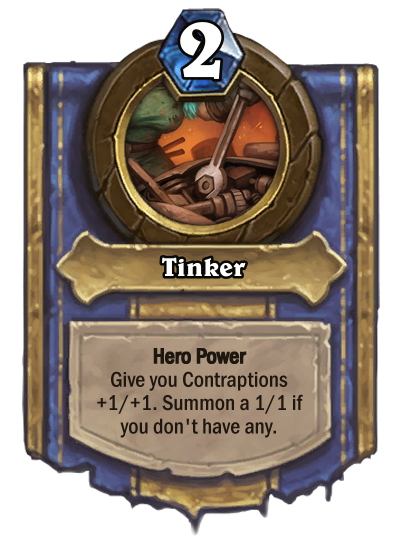 The original Hero Power actually Enhanced your Contraptions instead of just giving them +1/+1. Furthermore, the mechanic was initially planned to be part of the class from the get-go in Basic. 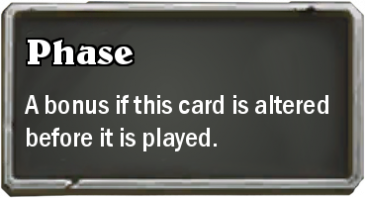 However, design constraints regarding following the "rules" of Hearthstone design made doing so impossible (or at least inadvisable). In a perfect world, where a class was being introduced to the game in late-stage design (ie now and not when the game came out) I think a number of those rules could be excused so long as the hero power was mechanically simple enough, which in this case I felt it was. 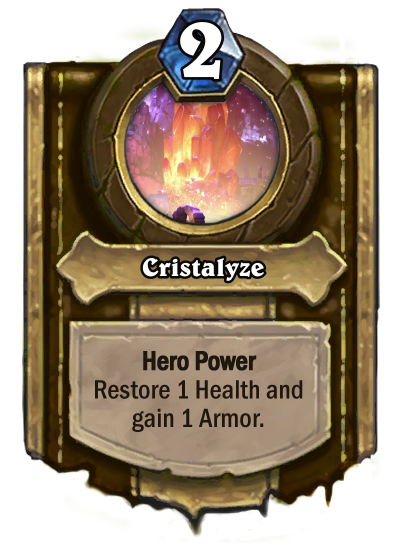 But in an effort to not get disqualified out of the gate, I course corrected and will be saving the Enhancing Hero power for the, err, Enhanced Hero Power? 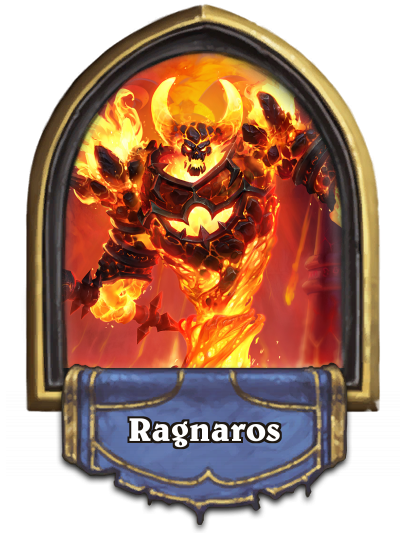 Have you ever felt like there aren't enough Old Gods in Hearthstone? No? Well, that's a shame, because now there's many more Gods and Eldritch stuffs in the game now! The Occultist is a class based around Madness and Power at a price, similar to Warlock, but different. It's main mechanics are LOTS and LOTS of card draw, to symbolize the Madness that you will be facing while you play with your cards, and it also contains many buffs, boardclears, and it's gameplan is to slowly grind out your opponent while controlling the board and creating huge threats for the opponent to remove. 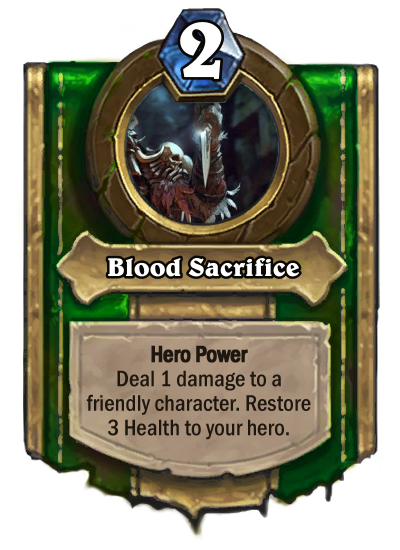 It's Hero Power, while it has less power than most others by itself, has plenty of powerful synergies with the class' cards, granting sustain to your hero even without any synergies. 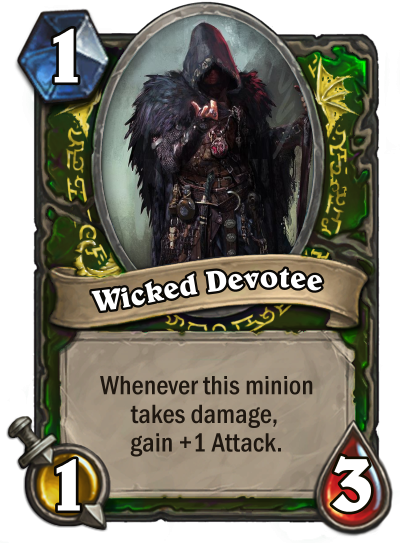 Wicked Devotee : A 1-drop that benefits out of your Hero Power, gaining attack without being snowbally, and granting some early game presence to the Occultist. 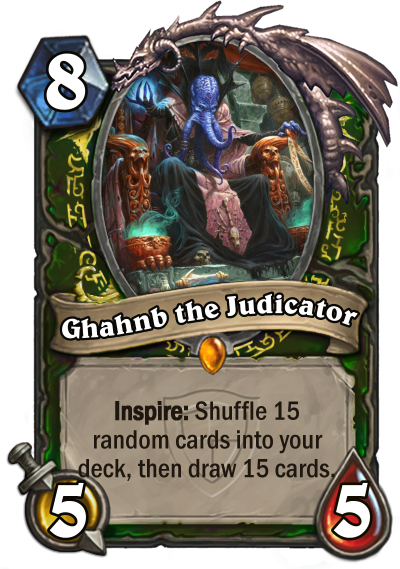 Ghahnb the Judicator : A fun card that creates lots of value, at the price of potentially milling a bunch of the cards in your deck, helping you to grind out your opponent in control matchups. Deep Madness : The name says it. 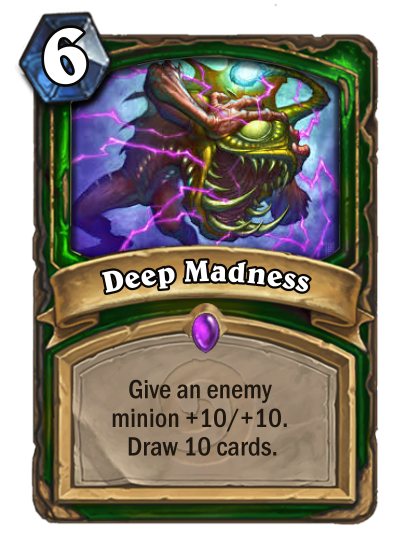 Only someone who has lost their mind would give an enemy minion +10/+10! But the reward being drawing 10 cards, it might be worth a try. Doomed Expedition : The big threats that you control the game for. 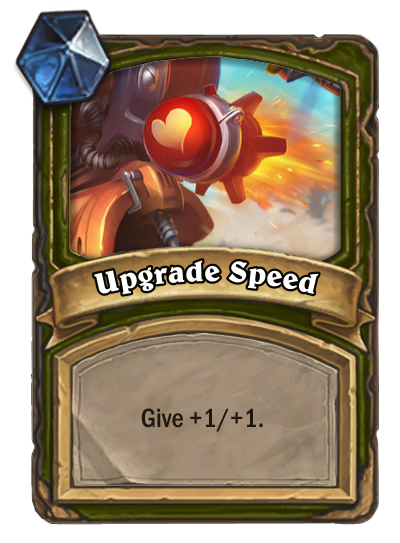 While the minion discovered may vary, giving anything a +10/+10 buff makes it into a lategame threat, but you might need to use a lot of your turns for it. Thanks for reading through me spilling out nonsense that makes sense about my cards! An upvote is appreciated, and so is any feedback. Ah, also, i really like H.P. Lovecraft and that kind of stuff, and that's where i took most of the inspiration for this class, as well as just loving grinding people out in control matchups. The World of Warcraft universe has a seemingly endless variety of fantasy creatures adventurer's can encounter. With so many otherworldly beings and humans that can wield vastly different powers, it can be hard to see any value in the regular folks. Despite having no extrordinary abilities, the Nobility of Azeroth have an unmatched aptitude for diplomacy. 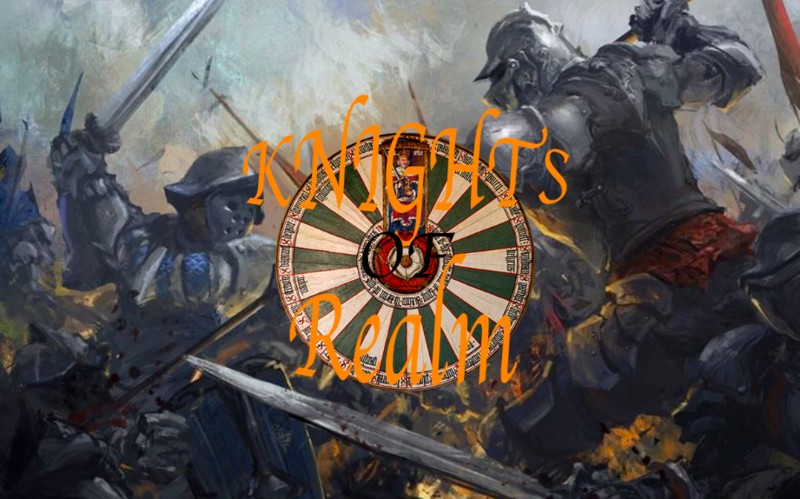 The Kings and Queens can command the masses and call upon dragons to aid them in battle. 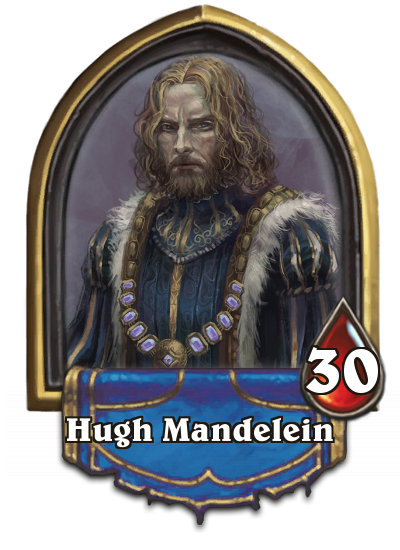 Hugh Mandelein holds the highest authority amongst mere men and will use everything in his power to match the tenacity of his foes and protect his realm. Hugh's rein is suceptiple to aggressive enemies, but is sure to win any war of attrition! Those who enlist in his army can expect to make fair trades with their opponent, only for them to find the exchange was far from equal. A Fair Trade can be used to ensure your resources can be utilized when necessary and lull your opponents into a false sense of security. If you can withstand the initial onslaught of your foes, no minion big or small will be able to stop Hugh from proving once and for all the common men of Azeroth are not to be trifled with! While this aptitude for persuasion may seem like an ovewhelming force, only the prestige nobility can utilize this power. Hugh Mandelein's pawns will need much more mana investment before attaining this potential. This makes Hugh's army far from one that can secure early victories. However, with a steady stream of resources Diplomacy offers his highly esteemed companions time to bypass your opponets last hopes of stopping your end of war strategies. Expanding on what was stated above, Hugh will have little resources to combat opponents who make quick use of his fair trades hero power. Opponents who exhaust their hand in a timely manner can often make Hugh's options of response underwhelming or downright unplayable. While those afflicted with greed however, will see their efforts easily thwarted! 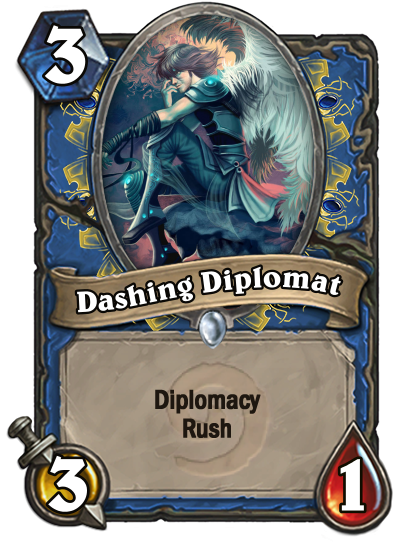 Dashing Diplomat: Dashing Diplomat excels at living up to his name, as anyone seeking the throne must do. Singular targets that threaten the realm such as the Vicious Fledgling, will find no quarter behind Taunt minions. While providing little to no value in bypassing Taunts in hopes of defeating the enemy, Dashing Diplomat can persuade those that would stop him from fulfilling his duties in protecting Hugh in the early stages of battle. Dragonman Maloriak: Once a man in Hugh's court, Maloriak was subjected to conditions that led to his acendency to a Dragonman! 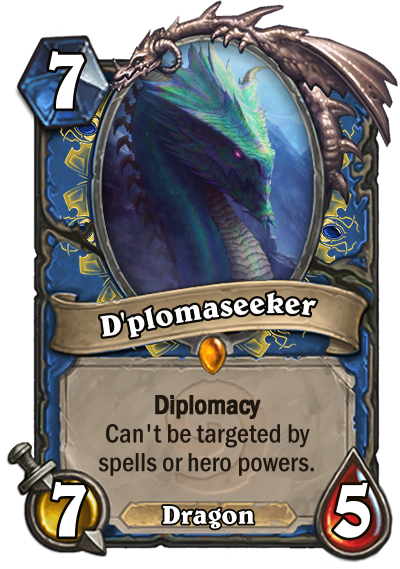 While he is a shell of his former self intellectually, he can still aid the realm through inciting cooperation from the Dragons of Azeroth. 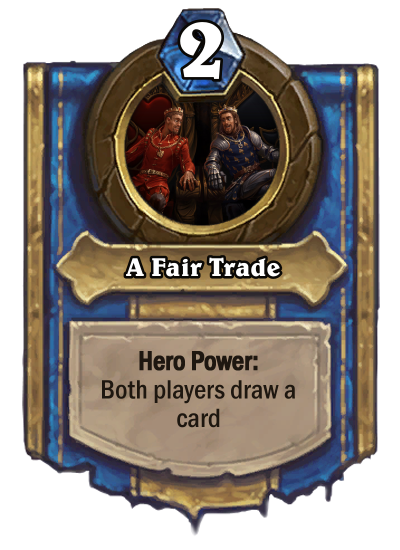 When combined with Hugh's A Fair Trade hero power, increased value is sure to be reached! D'plomaseeker: Hugh Mandelein's oldest and most trusted ally is difficult to stop when called upon under the right conditions. This makes his ability to bypass any foe all the more deadly! 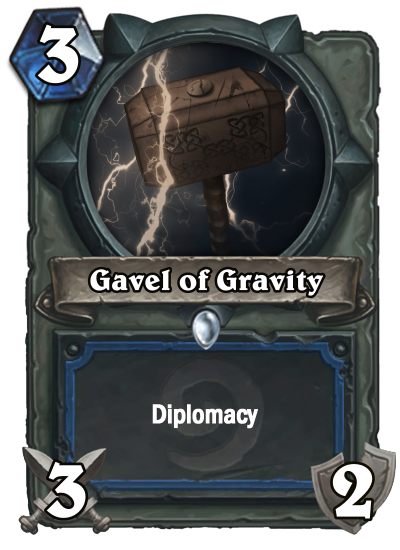 Gavel of Gravity: Similarly to the realms most dashing diplomat, the Gavel of Gravity is sure to put an end to key targets that threaten its wielder's rein. While Hugh may lack capabilities in addressing swarms of enemies, rest assured opponents who strive on seizing the tempo of battle will soon see the gravity of their situation. Additionally, when the dragons of old cannot be found, Hugh himself can take to battle and persuade his way to the enemies face! Determined Deterrent: To the men and women in Hugh's realm wishing to contribute to the cause, look no further! Your conjoined effort is needed to stop the biggest of foes. With a seemingly endless amount of pitchforks held high, even the fiercest of Mountain Giants will return from whence they came! Given the chance to fight on, Hugh's arsenal will remain in line with what has been showcased. Aggressive enemies will fin his castles easily seized, while cowards who hide behind blockades will soon feel the wrath of the slowly moving army of what will no longer be referred to as mere men! 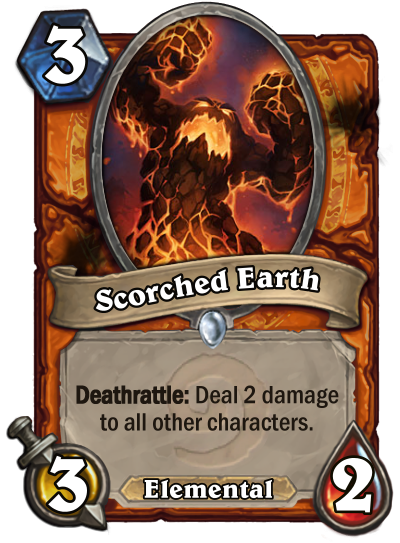 The class' theme is that it uses the elements to imbue himself, his minions and his weapons with the power of the 3 elemental forces of Azeroth: Storm, Earth and Fire. Manipulation of the top card of your deck, usually of a specific type. 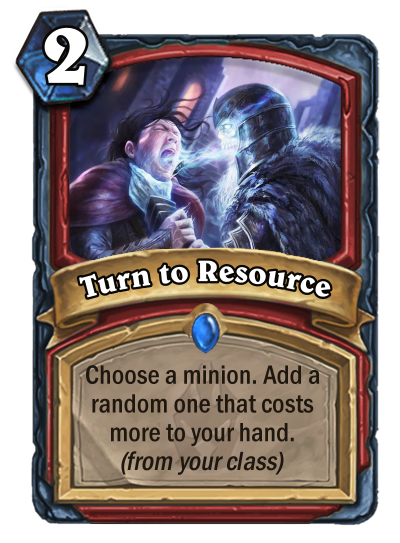 Turn to Resource is represents the (from your class) aspect of my entry, being basically the opposite of Rogue. 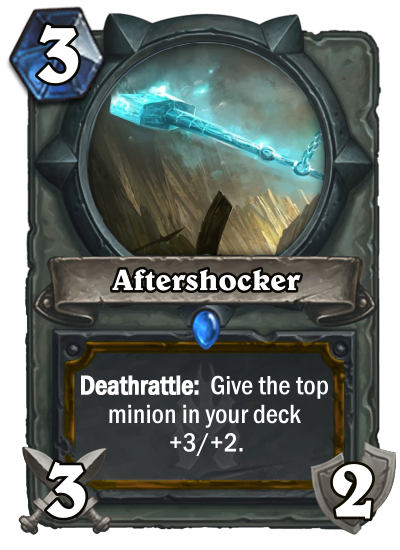 Aftershoker is a new cards and an example of another mechanic of my class, manipulating the top card of your deck in one way or another. 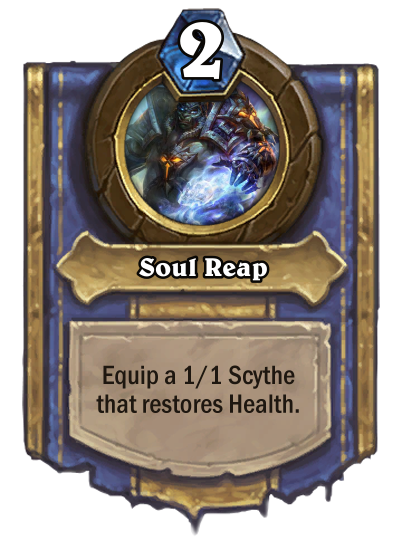 This replaces my keyword, which I've decided to drop for now, and S pitfire Blade, which informed people that my class has weapons. I especially want feedback on this one. 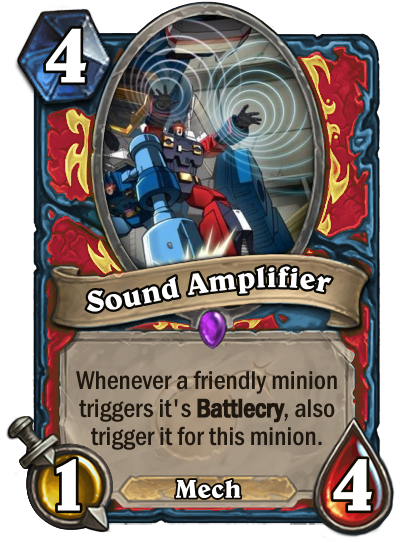 Sound Amplifier tells people about the class' focus on adjacent minions. 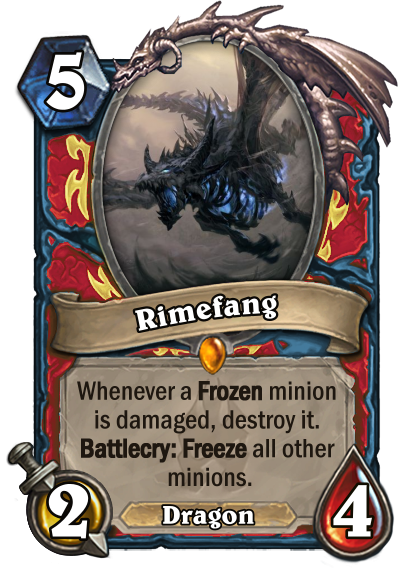 Finally, Rimefang is the resident legendary and a great example of what kind of AoE the Metamorpher has. CLASS: The Manippulator - Operates by incentivising you to use your hero power to power up enemy minions only to turn this power agains them. 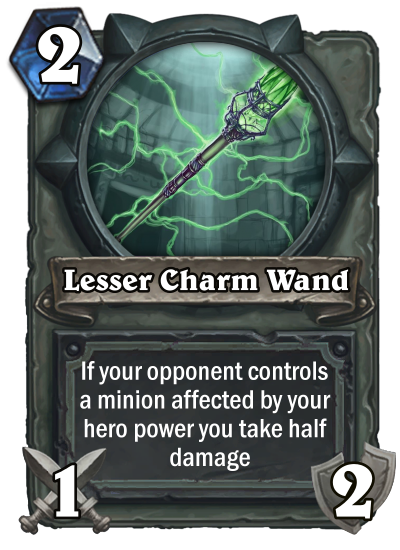 Lesser Charm Wand : Your first early game survival tool. THe damage would be rounded down in order to protect you from hyper aggresive decks. 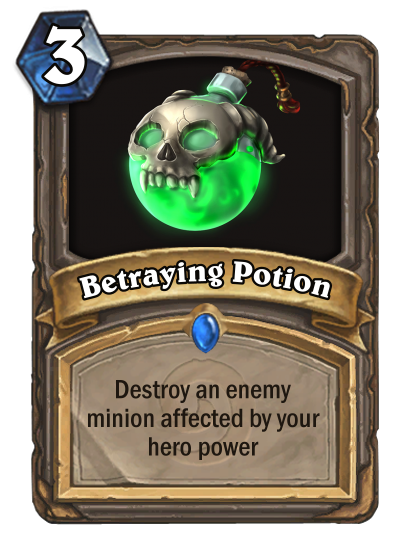 Betraying Potion: Powerfull hard removal. 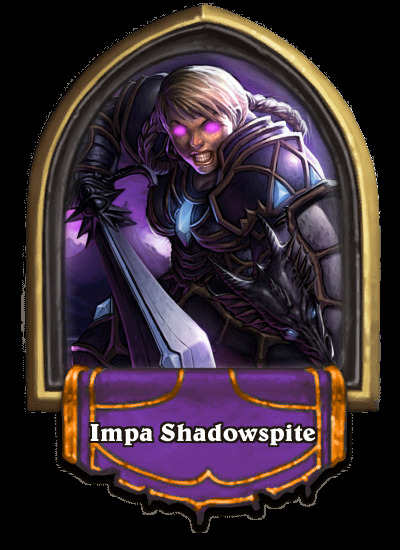 At face value its an assassinate, but being able to spread the mana cost trough multiple turns make it much stronger. 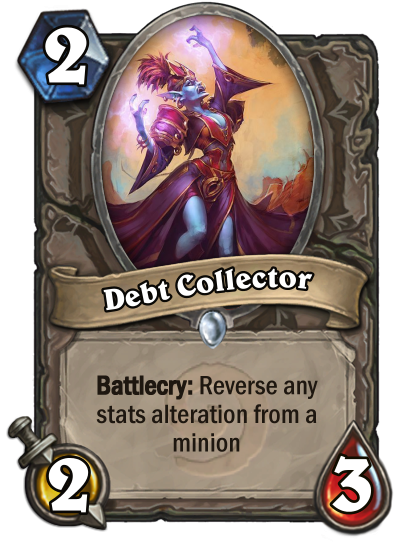 Debt Collector: Flexible card with some interesting interactions. Normally it alters the effects of buffs +2/+2 become -2/-2 and vice versa. It affects only during the duration of the buff, for example a reversed Curse of Weakness would only last one turn. It only affects the curent difference in comparisson to the original stat line, for example if a 4/3 receive +2/+2 and then is affected by equality it would become a 6/1 therefor after being affected by Debt Collector it would become a 2/5. When hitting an enraged minion it would only affect during that moment. 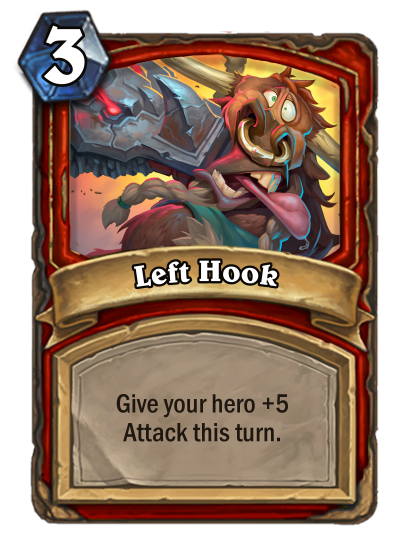 For Example if Amani Berserker is hit and receive the +3 attack buff when hit by this card's battlecry it would become a -3, if healed back to full health the enrage would lose effect and it would once again become a 2/3, and finally if the enrage once again triggers it would function normaly, being a 5 attack minion. Take your hearts to the ocean, swim to survive! The main class hero, Fionalle Aqua (Fi-own-all-ay) is daughter of the esteemed Thundorian Aqua, a famous protector of the sea and king of her home, The Coral City. She comes from a race of Water druids called Merpeople, amphibians that look awfully like humans. 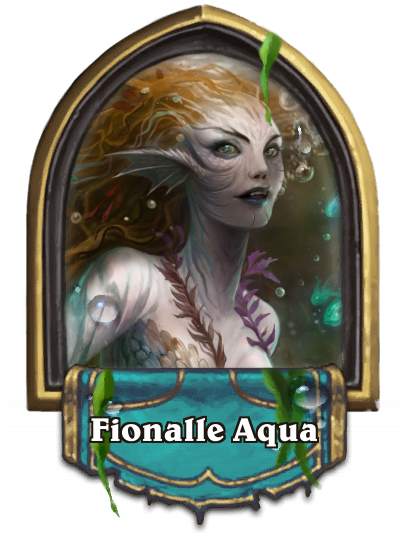 Fionalle is known for her great leadership skills, and restoration magic. As the next heir to the throne, she must embark on a journey against other foes to prove she is worthy of the title Ruler. 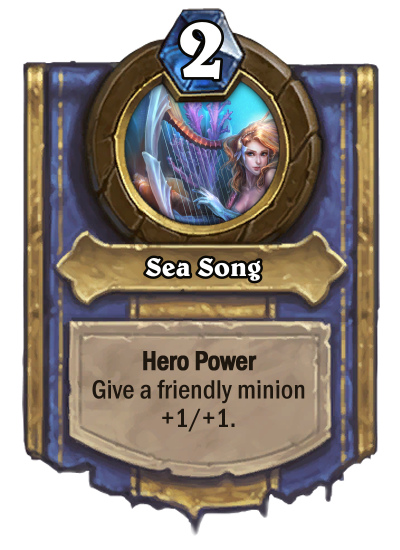 Sea Song is a very simple hero power, but yet one we haven't seen. Giving a minion stat buffs has shown up a lot, however there were no hero powers that directly affected stats. 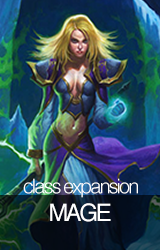 Healing: This class is good at restoring health to the hero and minions, since Fionalle is a druid after all. 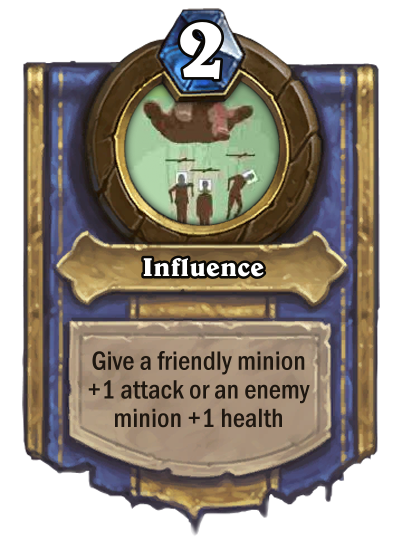 Board Advantage: This Class has alot of minons and cards that help it keep presence on the board. All that thing about Schools of Fishes. Card Draw: Drawing isn't an especially strong part of this class, however it makes up for it's controlling abilities. 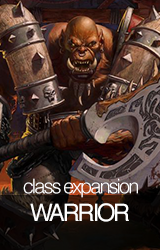 Hero Altering: This class doesn't really have a way to give a hero attack or armor, meaning lack of weapons. AoE Spells: Not a mutlitude of AoE Spells, however makes up for it with certain cards. 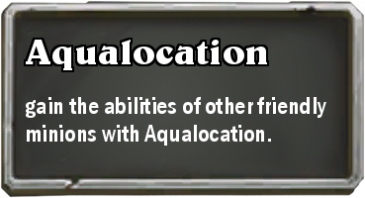 By abilities, I mean the text on other minions with Aqualocation. 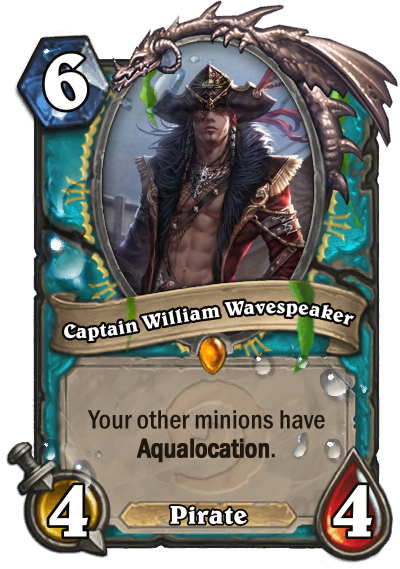 Of course, minions with Aqualocation will have lower stats than average, but it makes up for it with the helping hands. I feel this is a good class because multitudes of ocean creatures help each other out, and use each other to survive, which fits with the class theme of Sea Creatures. Both of these minions have Aqualocation, which means lets say we had one of each on the board. the Sea Eater would gain the, " Give your other minions +1 attack. " of the Amphibiloc , and in return that card would gain the Taunt of the Sea Eater. Amphibiloc: Your average, card that uses the class power card, but none the less useful. Your Raid Leader that cost slightly more from the Aqualocation. Also a Murloc, which is important since they are technically Amphibians that are sea creatures. 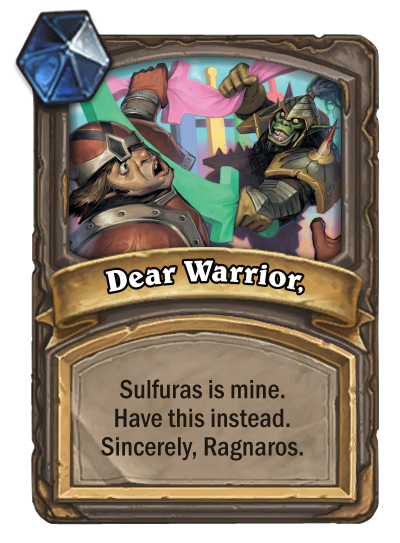 Flavor Text: He shares his strength, but never his food. 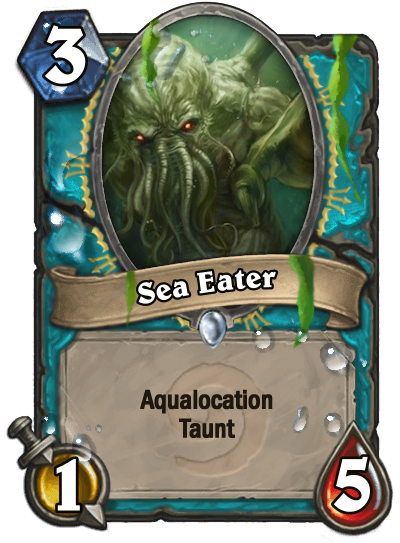 Sea Eater: A early game taunt minion that can give other cards the ability with its Aqualocation, a good semi stall and useful to create control on the board. Flavor Text: It would grab your dangling leg off the bed. If it could leave water. 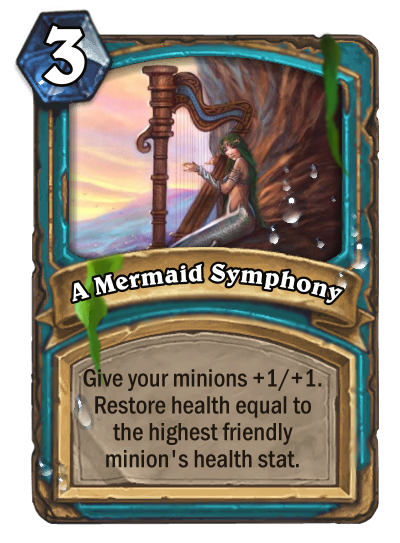 A Mermaid's Symphony: A simple mechanic that shows the classes buffing abilities and restoration, being able to potentially heal a large amount later in the game, or buffing your minions earlier. It's incredibly flexible, being able to be used at almost any point of the game. Flavor Text: Some say you only hear a Mermaid's Song once in your life. Clearly no one thought about the mermaid. Captain! It's Going Down! 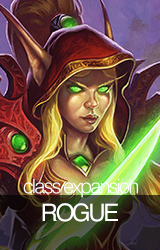 : Also shows off this class stat buffing abilties, however it also shows how it can control the board, being similar to a Doomsayer. 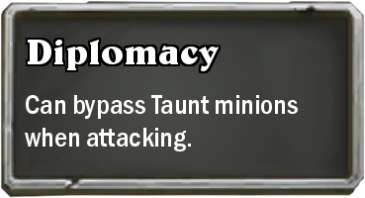 I believe it cancels out having to wait for your opponents turn and the buffs, since it creates some durability, but gives your opponent a chance to react. Flavor Text: Give me a second captain, it's Control Warrior. Captain William Wavespeaker: I thought this name was really cool. 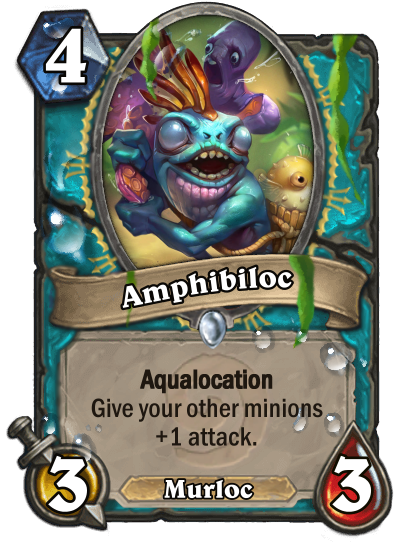 Also it really demonstrates the power of Aqualocation, for example if you had an Amphibiloc on the board, and just two other minions, that makes all of your other minions have +3 attack. However, he doesn't get buffed himself which makes him a big target for spells, which I think makes for a reasonable trade off. Flavor Text: No one alive has ever seen this man with a shirt on .